September is right upon us. It is actually a little crazy how quickly this year is going by. I have a couple of busy months ahead of me so I imagine that the rest of the year will fly by. 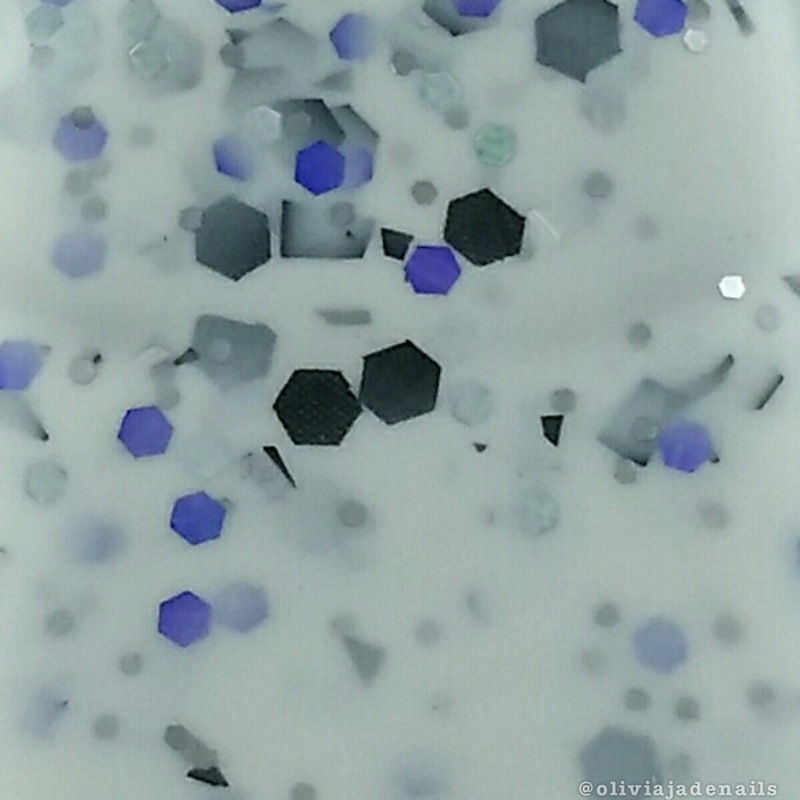 Anyway, while August may have slipped past, the gorgeous polishes that Emily de Molly released are still available and I assume most will be around for a little while still. I figure now is the perfect time to share my swatches and review of the five polishes that were released. These are the polishes that were released in late July. I have ordered the ones that have recently been released and I plan on swatching and reviewing those when I receive them. Emily de Molly is one of those brands that you can guarantee great formulas. This range is no exception. All polishes are easy to use and only required two coats to be opaque. 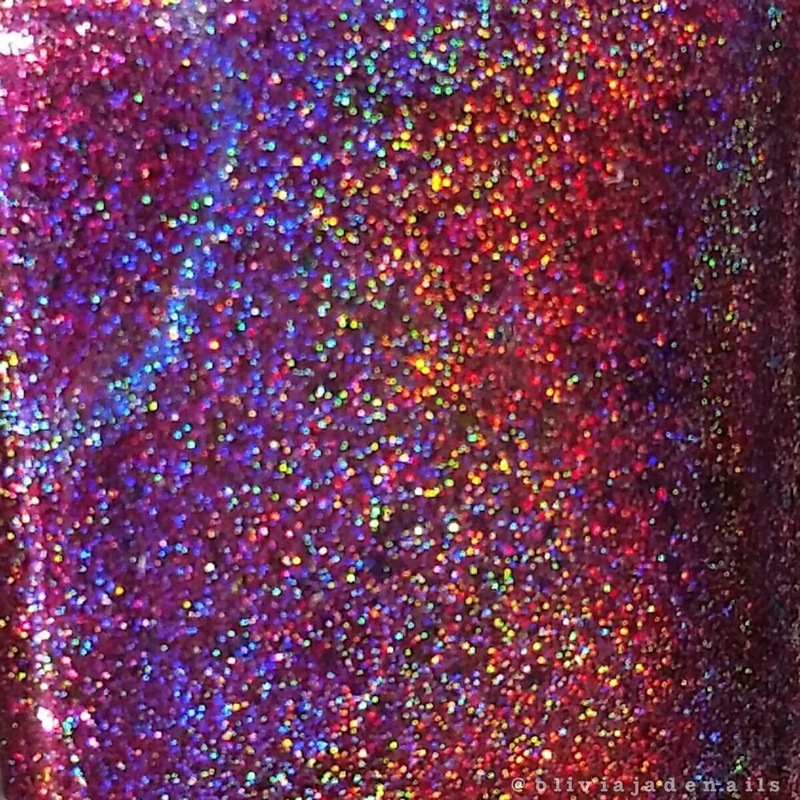 Crestfallen is a dark purple holo with a heavy pink to gold shimmer. 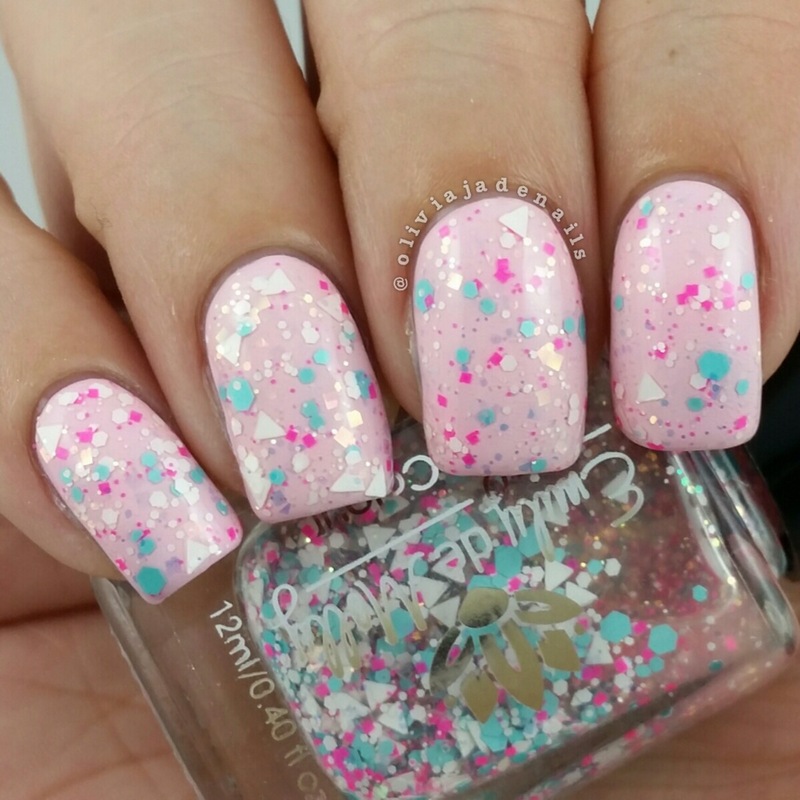 Such a super pretty polish. 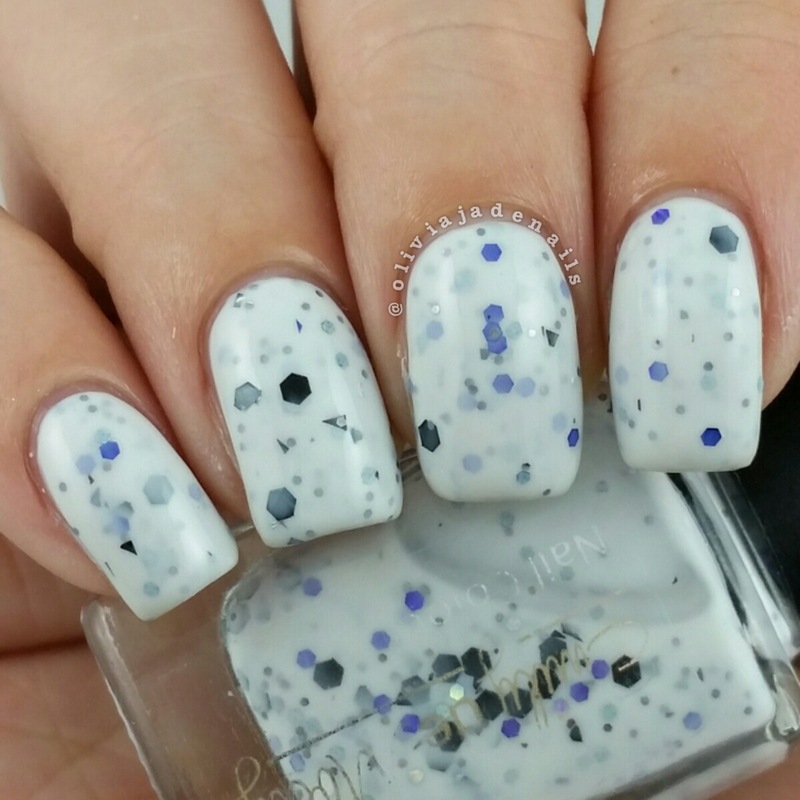 This polish looks quite opaque so you could probably get away with one coat. 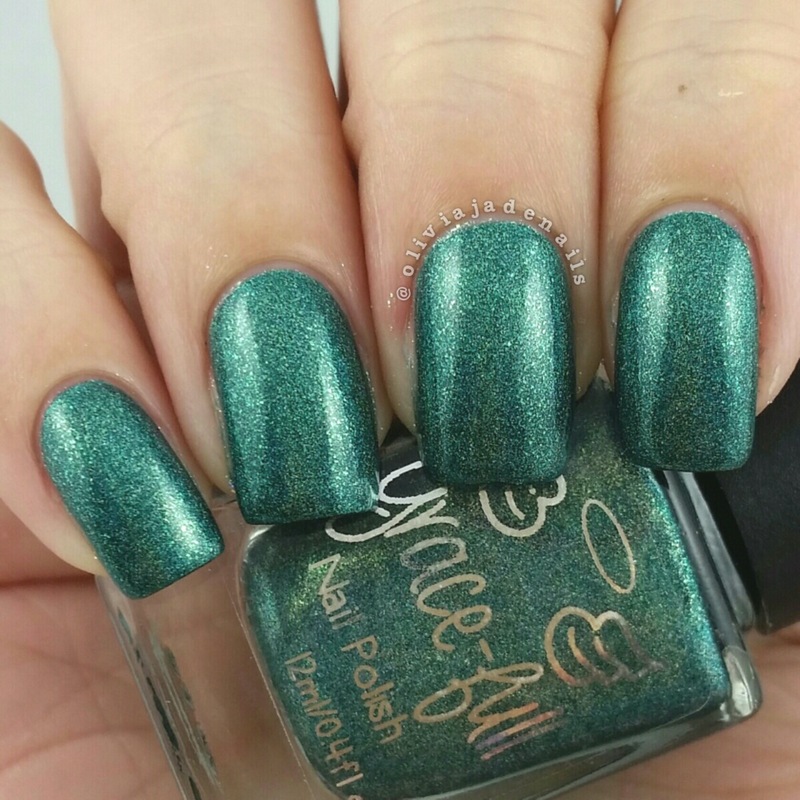 Erratic Behaviour is a medium green holo polish. I actually think this would be great for Christmas. 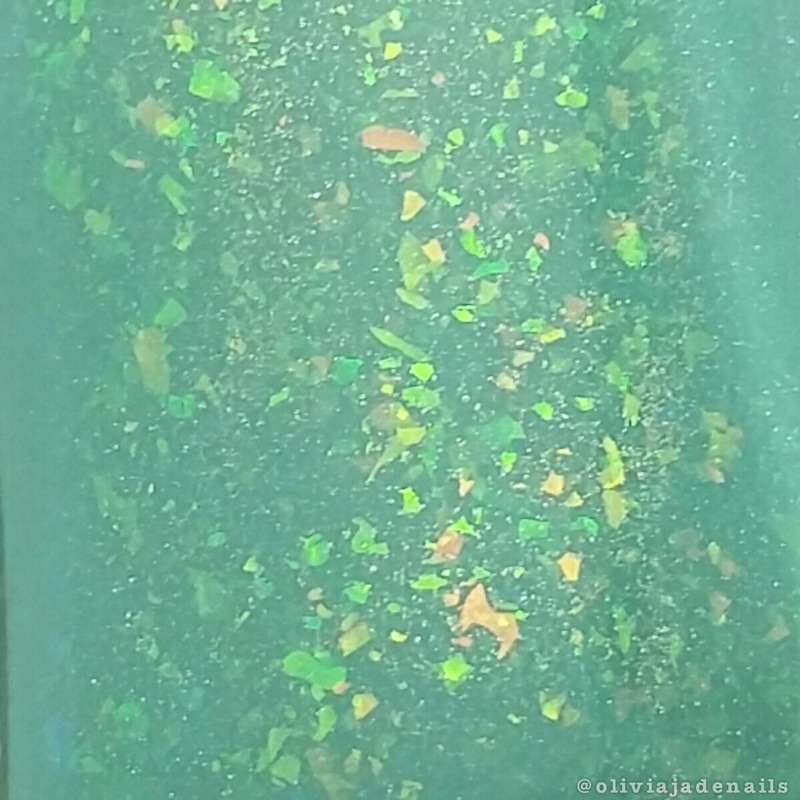 No idea why I think that but I just can see me using it for some Christmas nail art. 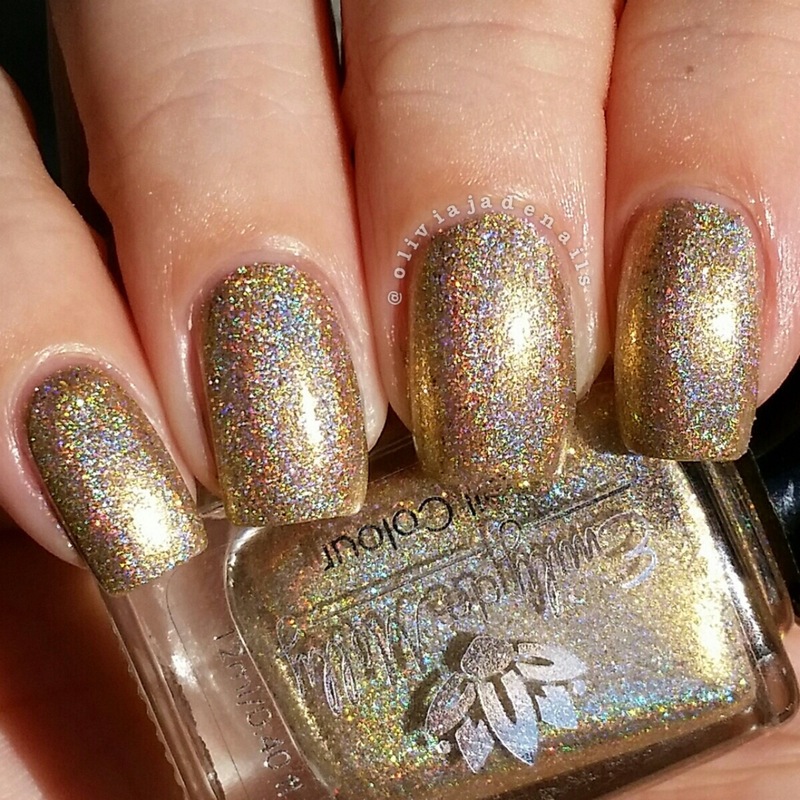 Record Keeper is a gold holo with gold flakies and gold holo glitter. Super pretty and very sparkly. 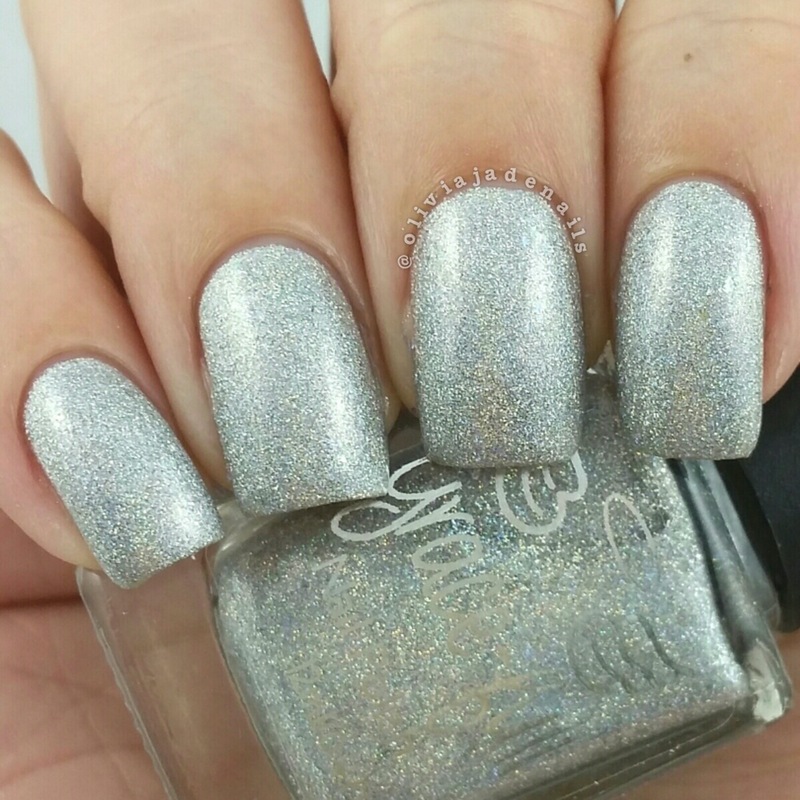 in certain lights you can see a very slight nail line with two coats, so depending on how fussy you are you may need three coats with this one. 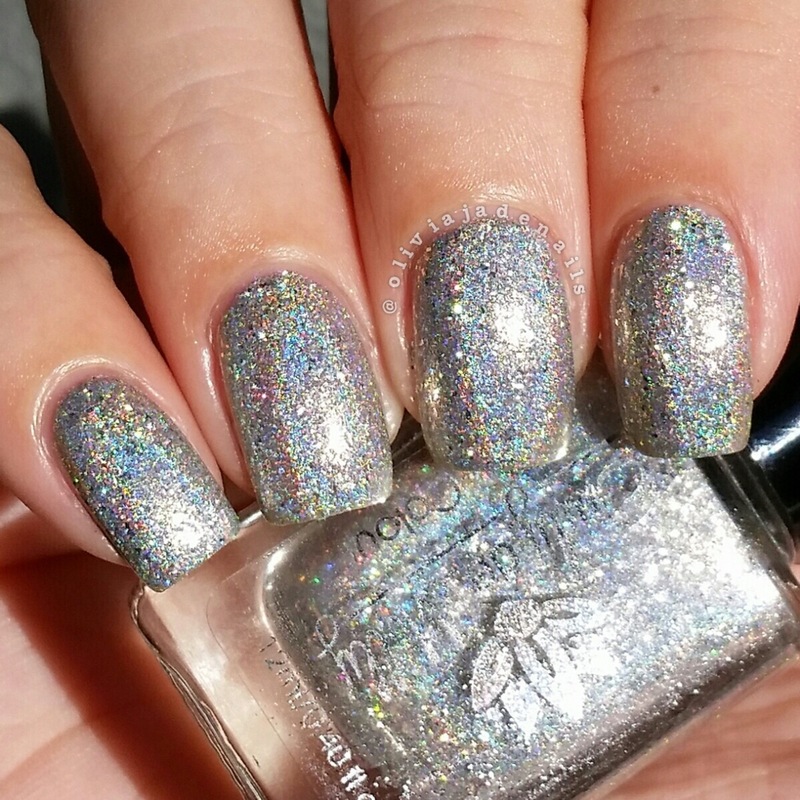 Stockpile is a silver holo with silver flakies and silver holo glitters. Basically it's the silver version of Record Keeper. 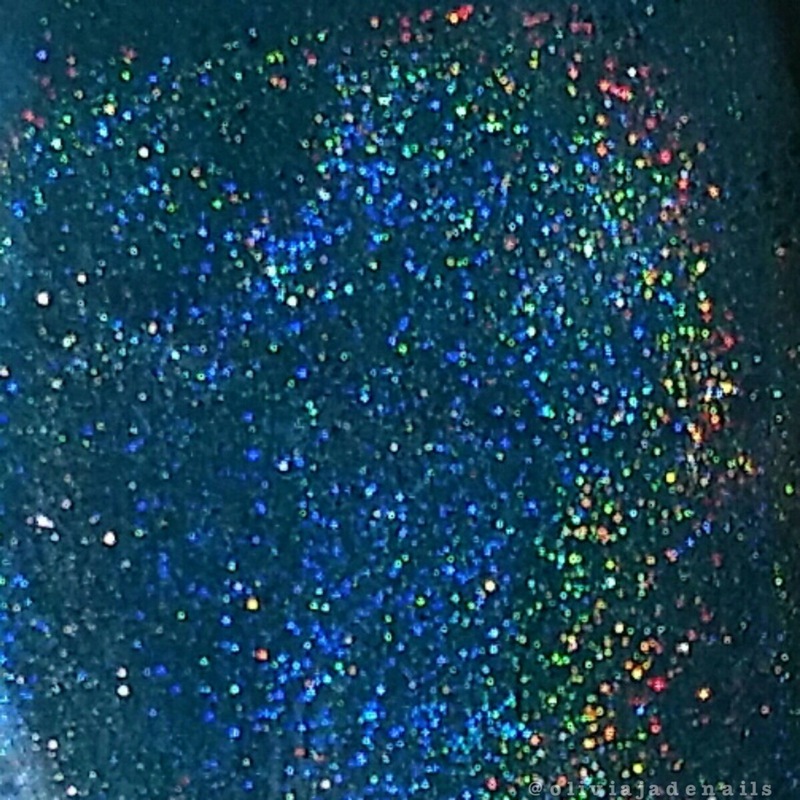 Again, really pretty and super sparkly and the you still see a slight visible nail line after two coats. 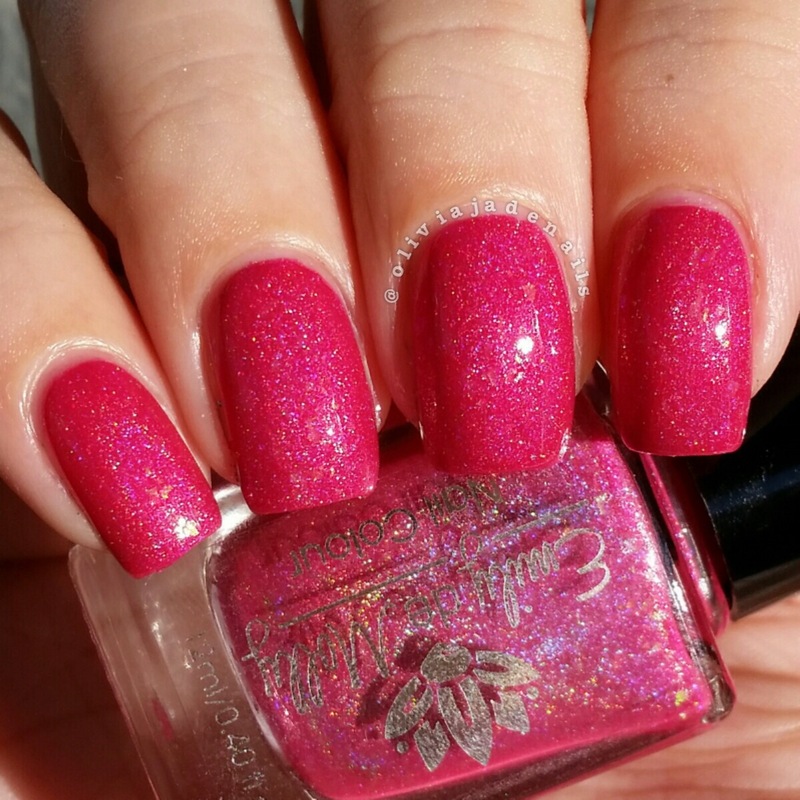 Vivid Dreams is a bright pink holo with iridescent colour shifting flakies. I think this is quite pretty, although it does have an odd smell to it. No idea how to describe it. I only noticed it as I was applying it but not after the application was done. Overall I really like these polishes. They are all pretty and the formulas are great. 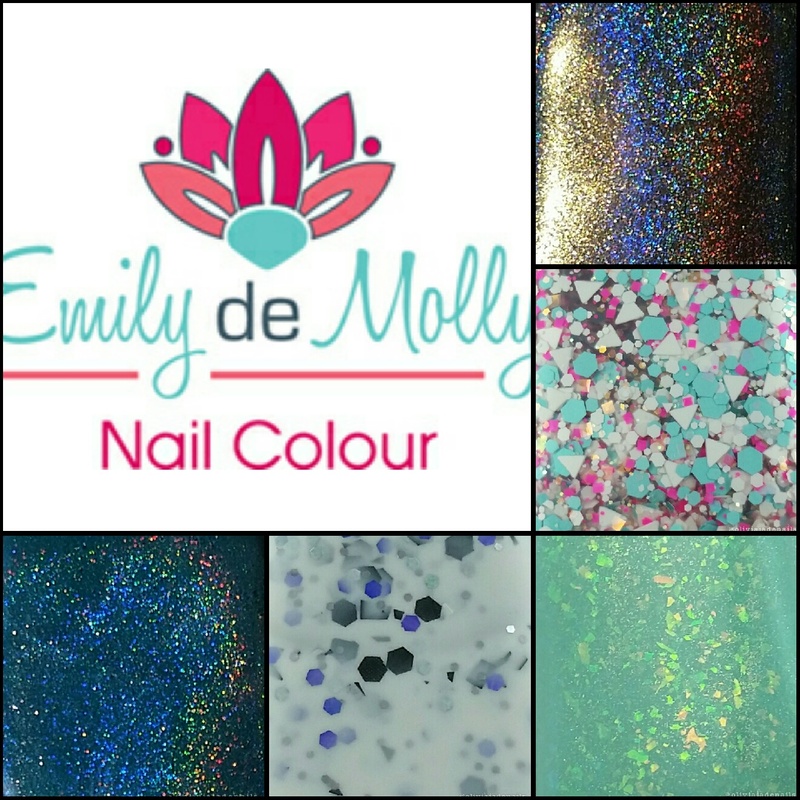 These polishes are still available from Emily de Molly's Australian site. I am not sure about the availability of these polishes for international customer. US customers please check Emily de Molly's US site, and for all other customers head over to the stockists list. 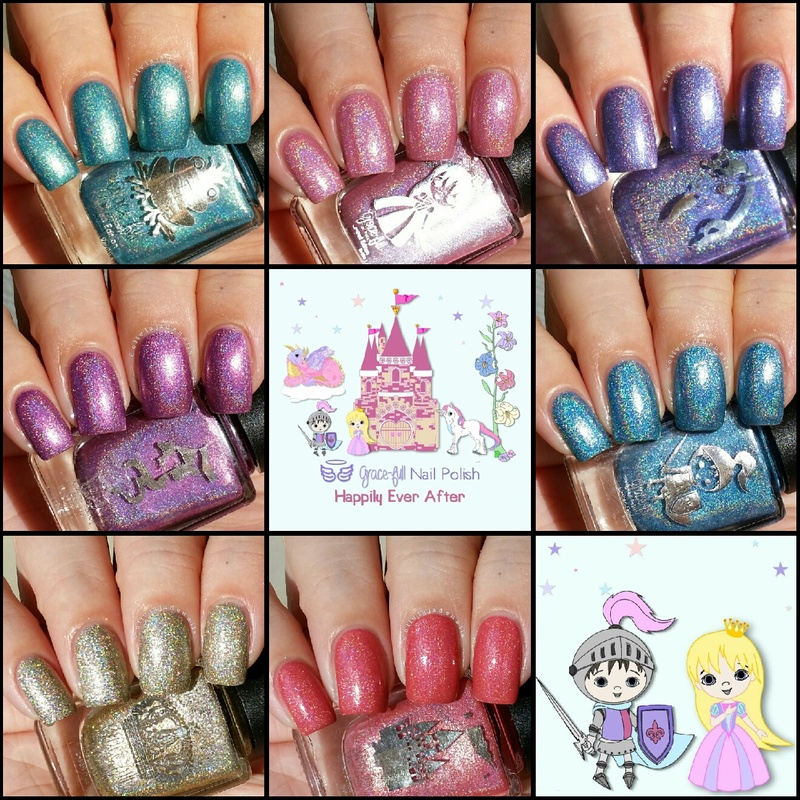 Earlier this week I shared with you Grace-full Nail Polish's Happily Ever After Collection (you can see this post here if you missed it) and I mentioned that there was a lot of goodies being released as part of Grace-full's first birthday celebrations. Well today I bring to you the What A Girl Needs collection. This is the second collection being released on September 1st along with cuticle oils, mani bombs, nail vinyls and jewellery. This collection is inspired by images on a storyboard created by Grace-full Nail Polish customers of their dream polish and consists of six polishes. Blue S-Teal is the big sister to Do The Magic! 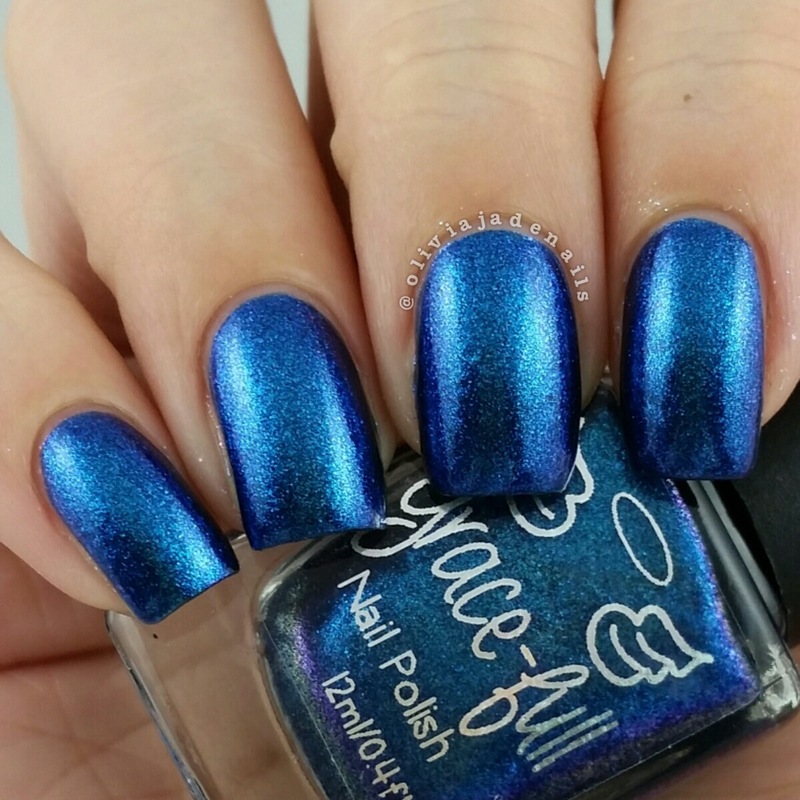 (you can see my swatch of this polish here) and has the same finish with color shift but this one moves through blue, steel blue and teal. 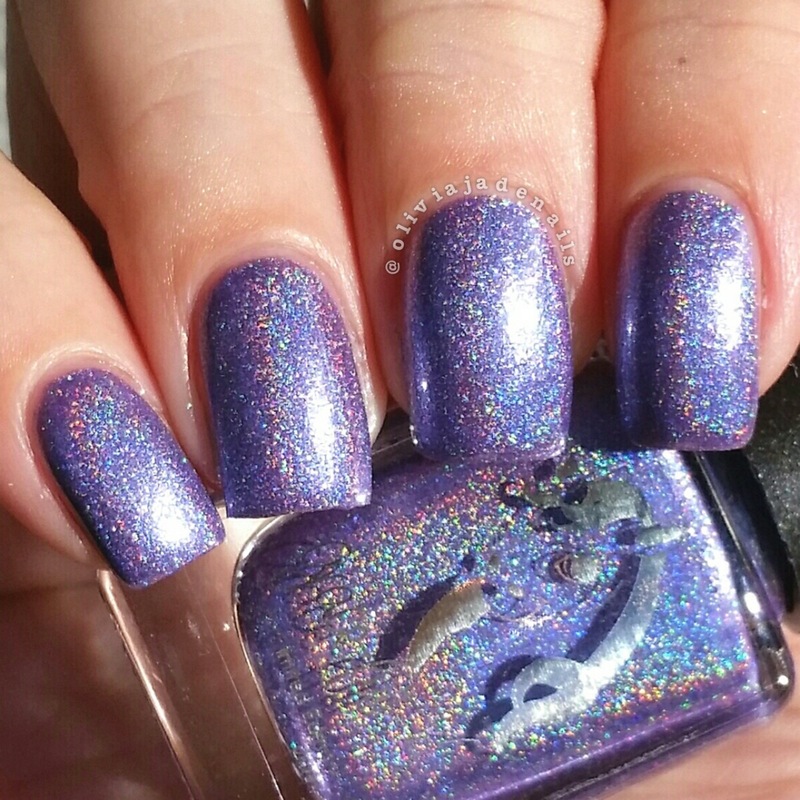 Beautiful polish, but really hard to photograph. You can see the purple shift in person in some lights but my camera just won't capture it. Formula is great and only needed two coats to be opaque. 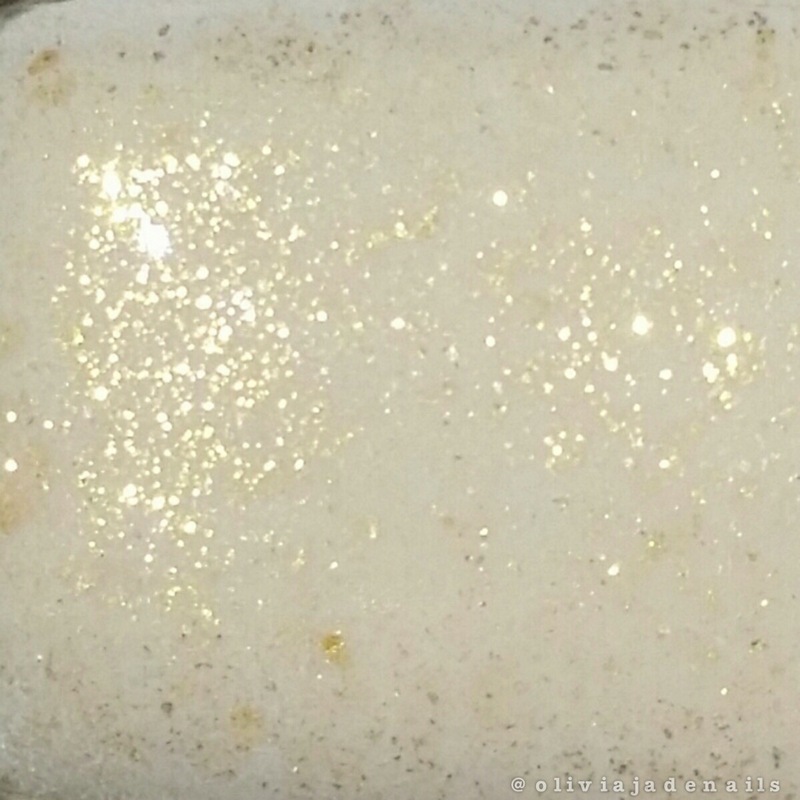 Butter-ful is a white base with two sizes of gold flakes that turn the white into a creamy colour. The formula is easy to work with, although I did find that it applied slightly uneven on me. I needed three coats to even it out. 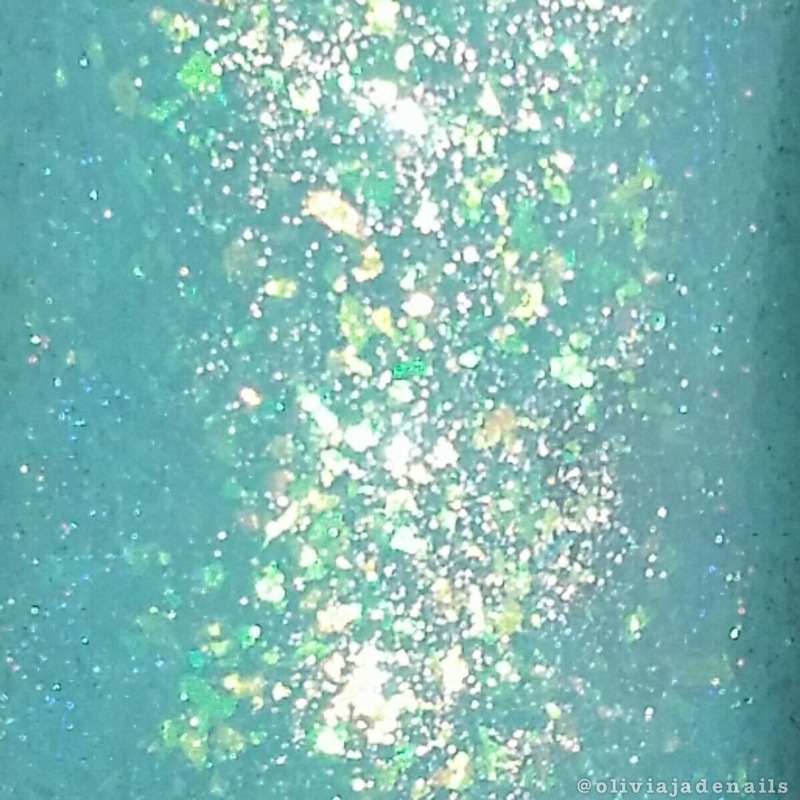 Elementeal is a teal jelly base with teal and copper super holographic mircoglitter. 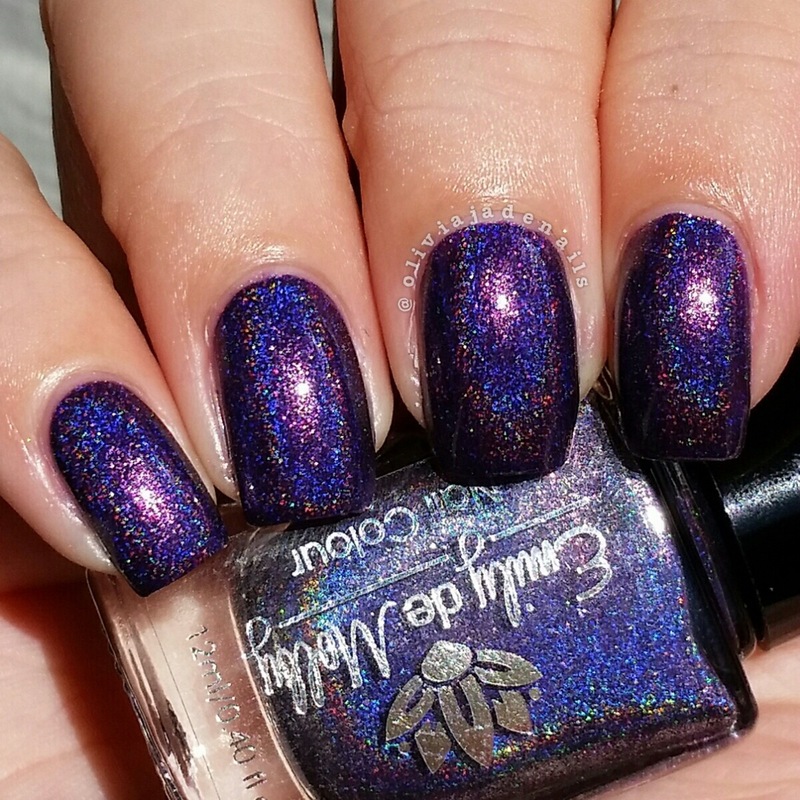 This polish is super sparkly (why don't cameras just capture everything exactly like the eyes can see?) The formula is slightly thick but it is still easy enough to work with. I used two coats for my swatch. 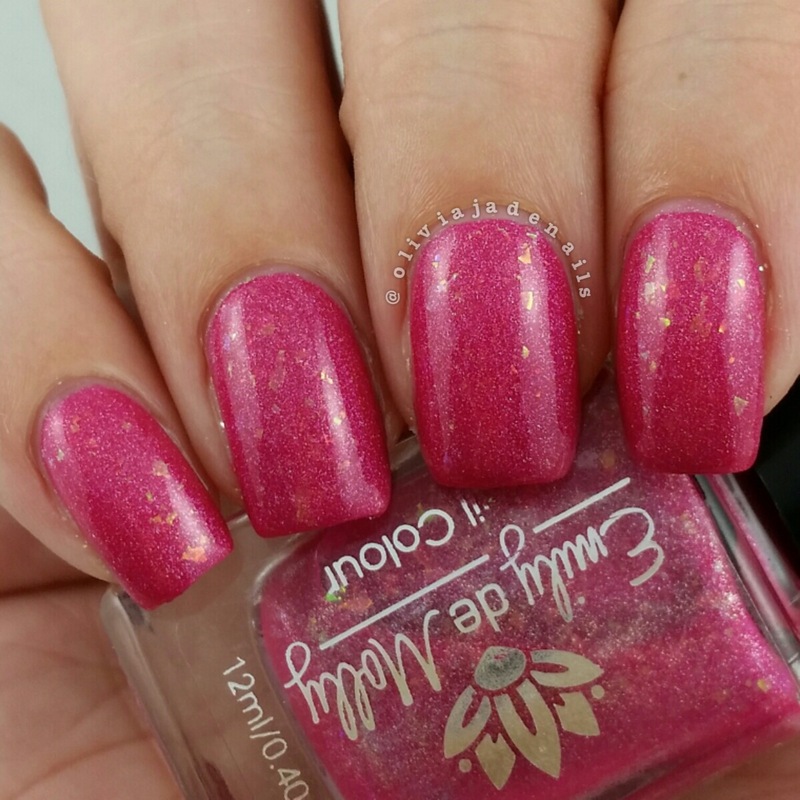 Pinktopia is described as a deep pink with sparkle and UCC chrome chameleon flakies. 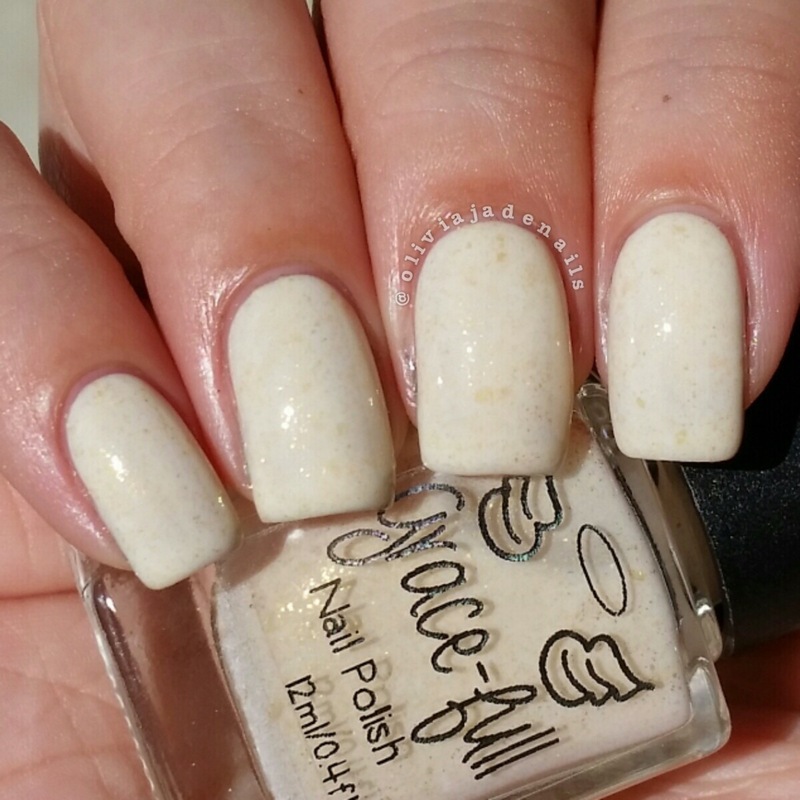 Great formula and only requires two coats to be opaque. 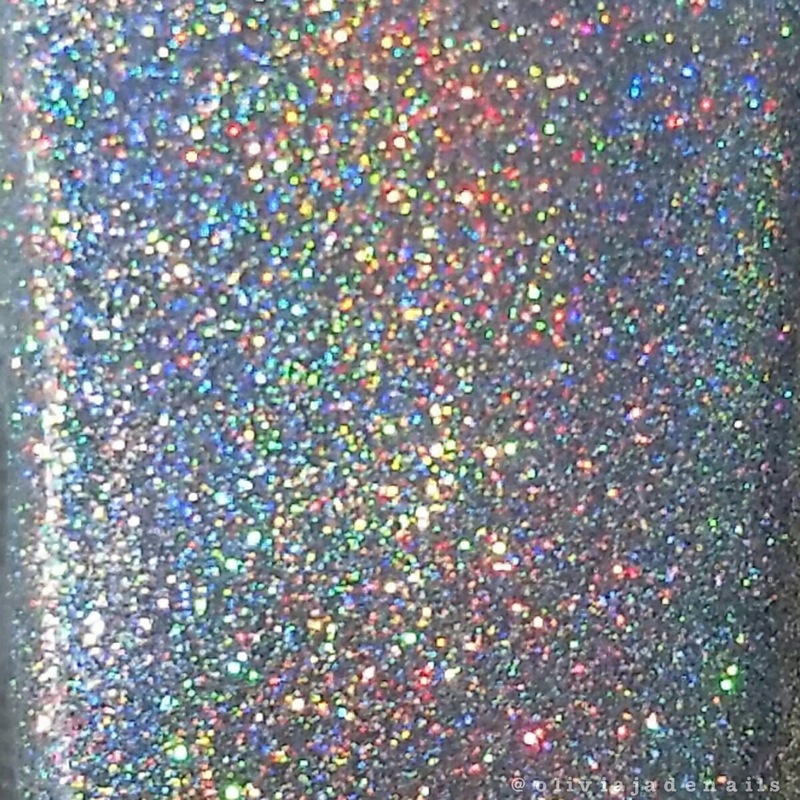 Rain Upon The Moon is the baby sister to White Rider (you can see my swatches of this polish here, which also happens to be my first review post that I have ever written) and has the same super sparkle just with smaller silver super holographic glitter, a silver tinted holo base and rainbox flakies throughout. Talk about bling! Totally in love with this one. Definite must have in my opinion. 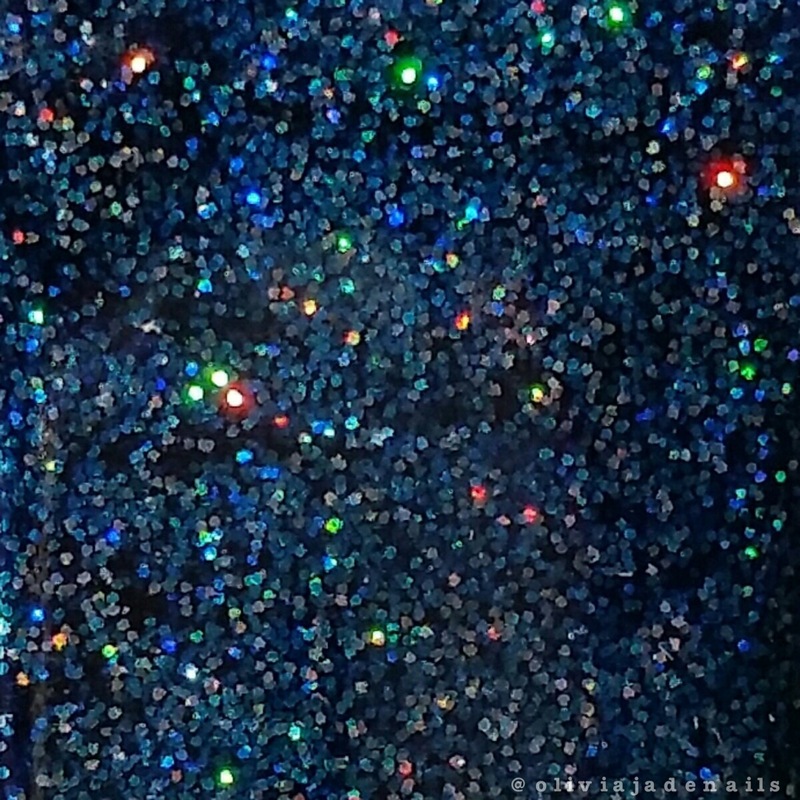 Again, pictures just don't show the true sparkle of this baby. The formula is fantastic and only needs two coats to be opaque. 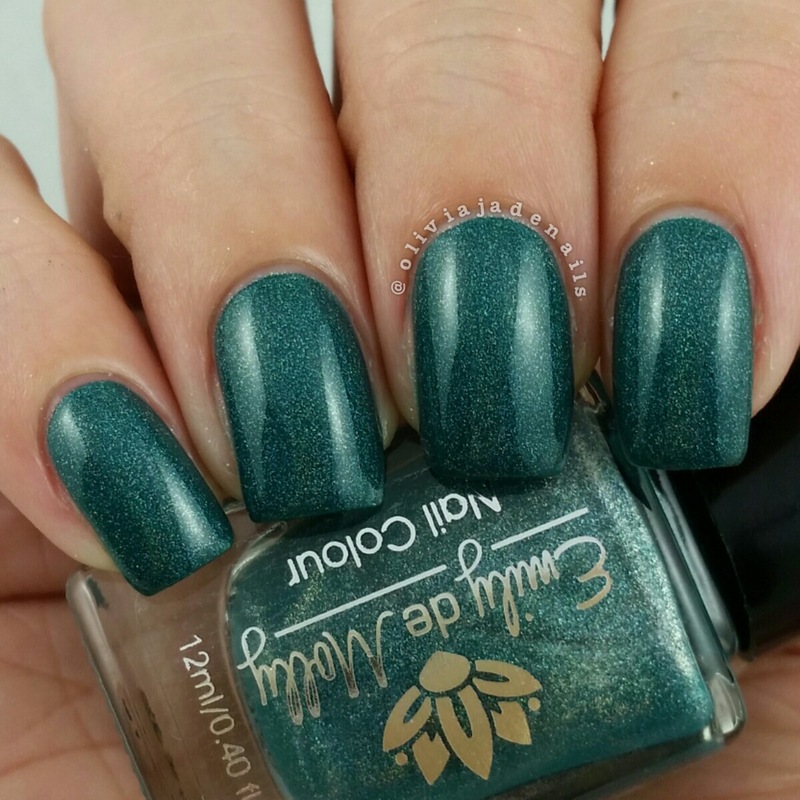 Royal Forest Nymph is a deep jewel green linear holo that has a slight shift to gold. The formula is great and only requires two coats to be opaque. 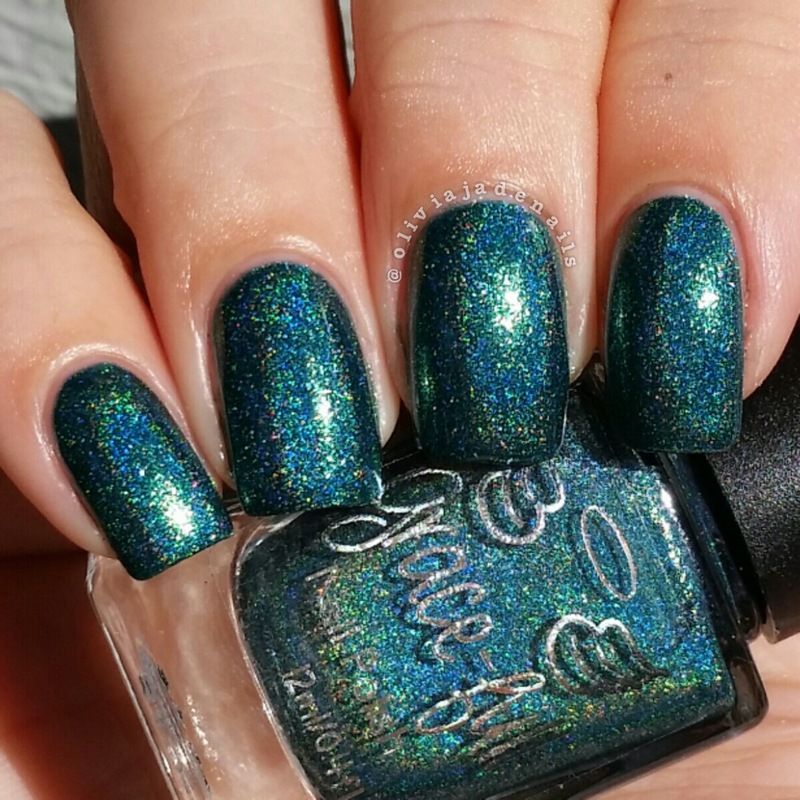 I love that Grace-full have made a darker collection to be released along side a lighter collection like Happily Ever After. There is definitely something for everyone in these releases. 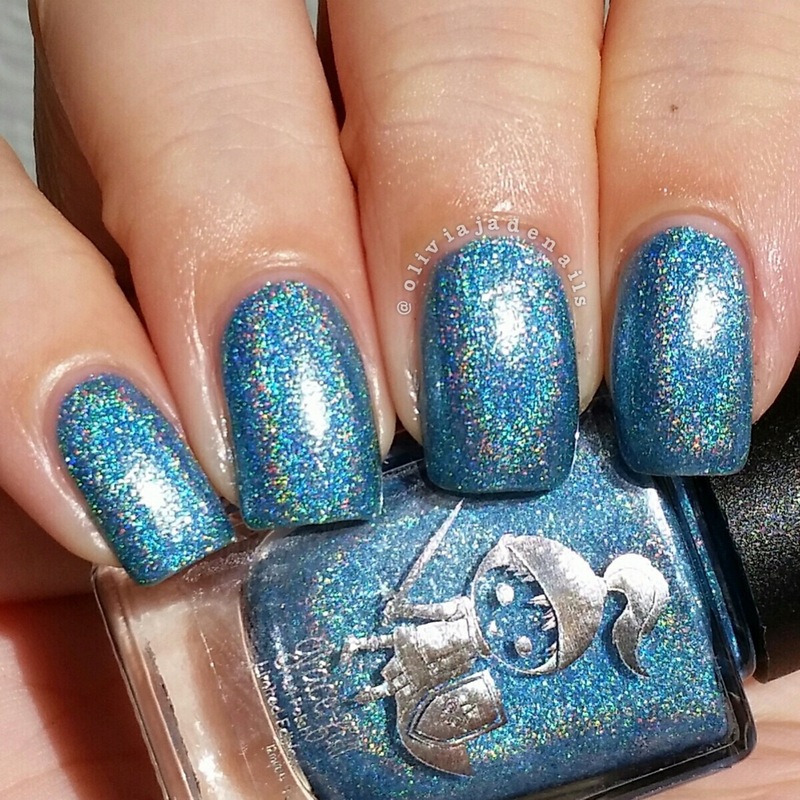 My personal favorites from this collection are Rain Upon The Moon, Blue S-Steal and Elementeal. The What A Girl Needs Collection is being released on September 1st at 7pm and can be purchased from the Grace-full Nail Polish site. As mentioned earlier in this post, there is a bunch of new and exciting things being released in September. Make sure you are following Grace-full's Facebook Group for more information and pictures. It has been a year (or nearly been a year) since Theresa, the creator of Grace-full Nail Polish, asked me to test and swatch polishes for her brand. 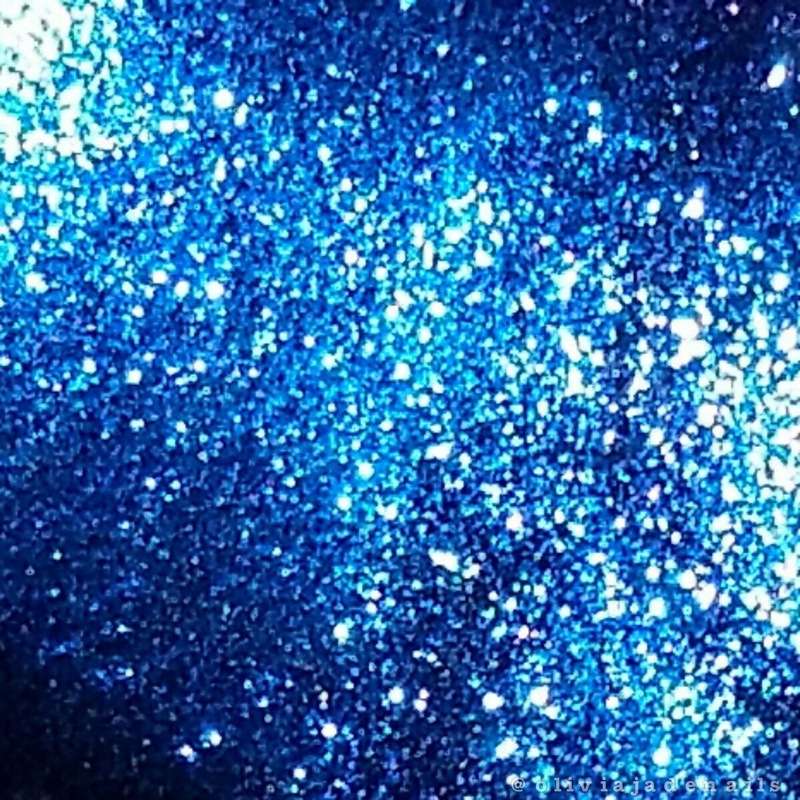 Of course I said yes, and now nearly a year on I have two drawers full of some gorgeous glitters, cremes, shimmers and holo polishes from Grace-full Nail Polish. Now Grace-full are going to be celebrating their first birthday in a BIG way. There are soooo many goodies coming so prepare your wallets/bank accounts because it is a big month. Seriously! I'm talking a heap of new polishes, cuticle oils, mani bombs, nail vinyls, charms and jewellery. There is also scratch cards with a range of prizes available. So much goodness! Now let's get into some of the polishes. 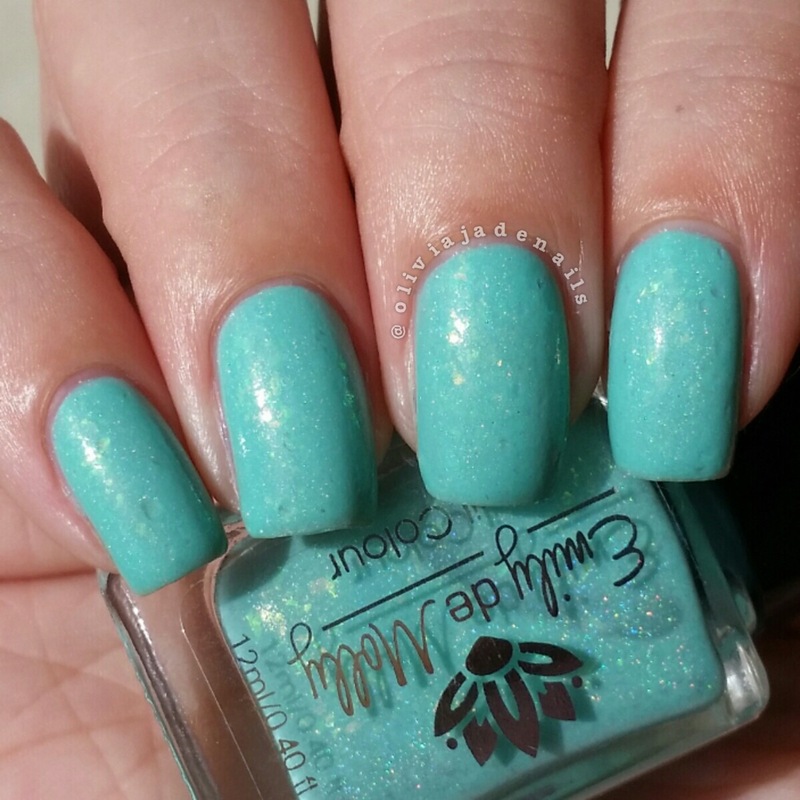 Today I have the Happily Ever After Collection to share with you. 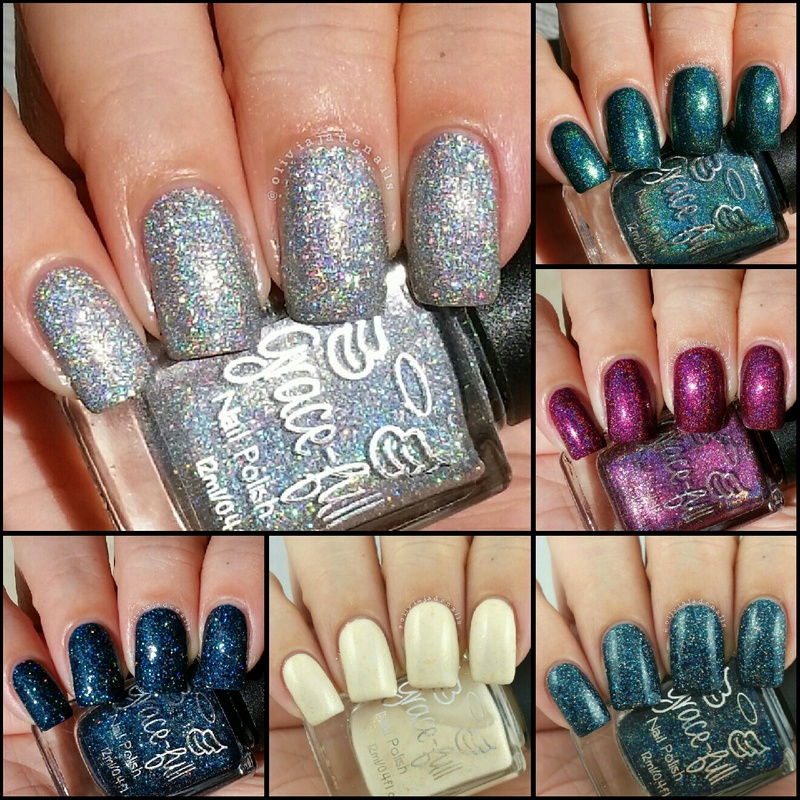 This collection consists of six soft colour holos all with rainbow mirco flakies and a gold with pastel flakes. Each polish comes with a limited edition matching bottle label, which I think are super adorable and a great touch to this collection. The formulas on each of these polishes are fantastic and all only need two coats to be opaque. 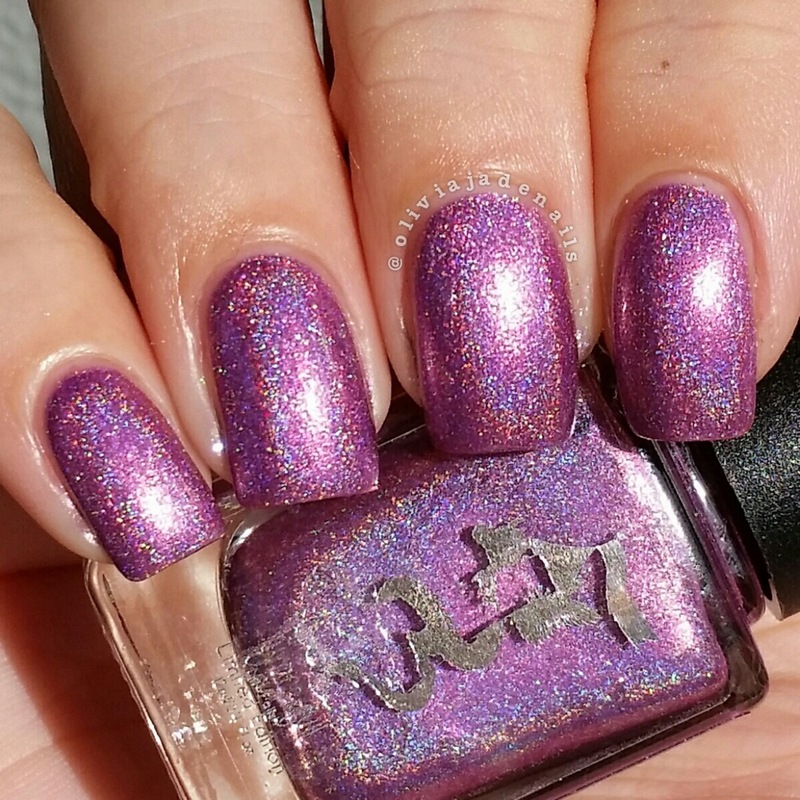 Amethyst The Unicorn is a mid purple linear holo. As a purple lover this is definitely one of my favorites from this collection. 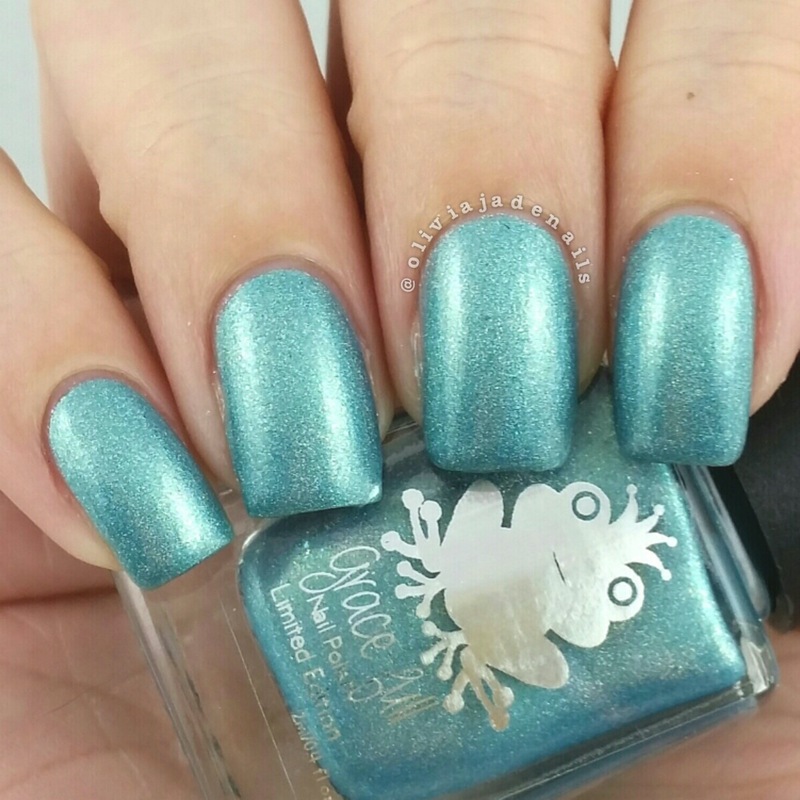 Charming Frog is a mid pastel green linear holo. Coral Castle is a coral linear holo. 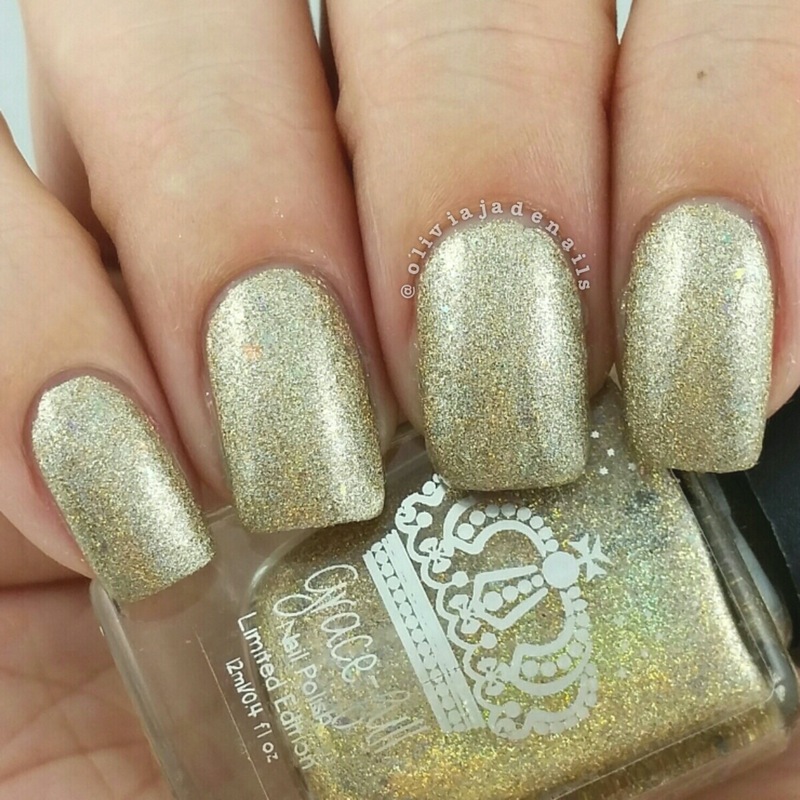 Crowning Glory is a holo base tinted gold with fine super holographic micro glitter and crystal rainbow pastel flakies. 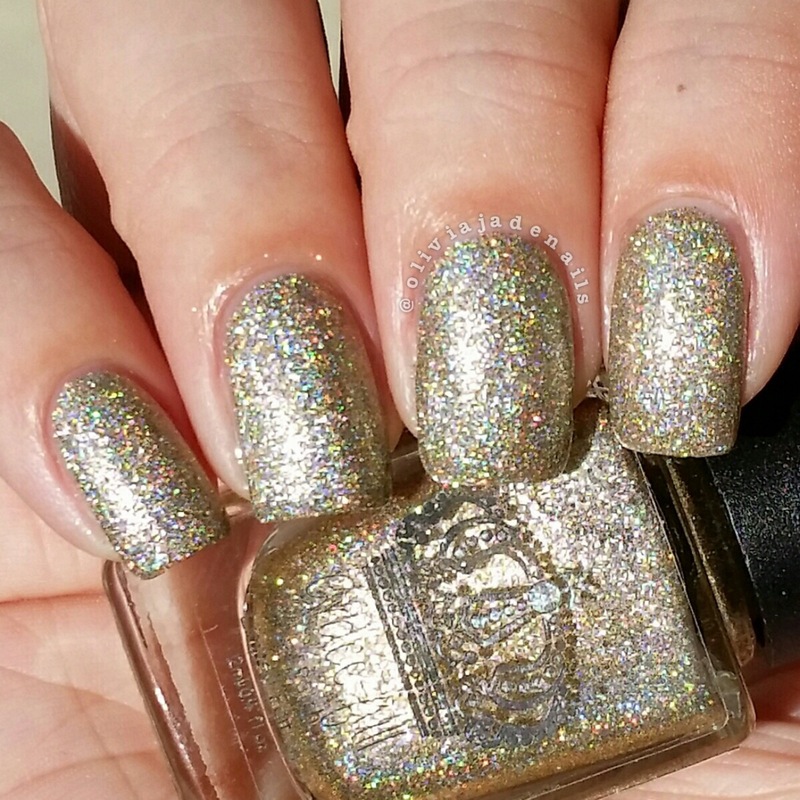 Now be warned - this polish is super sparkly and may cause accidents while driving. Pictures really just don't capture the sparkles. 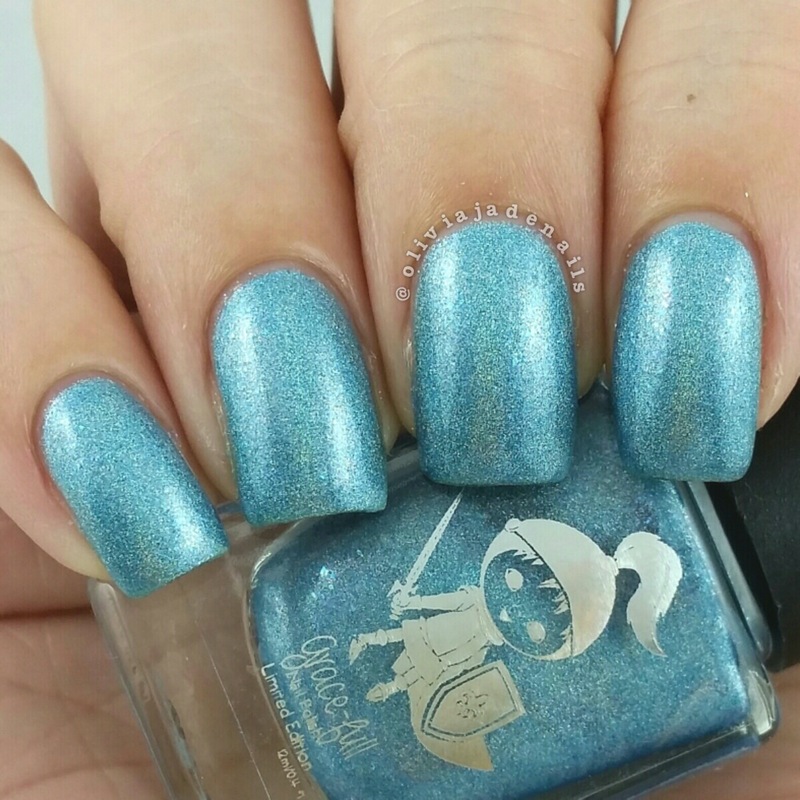 Knight Silver Lake is a mid blue with blue flakies in a linear holo. 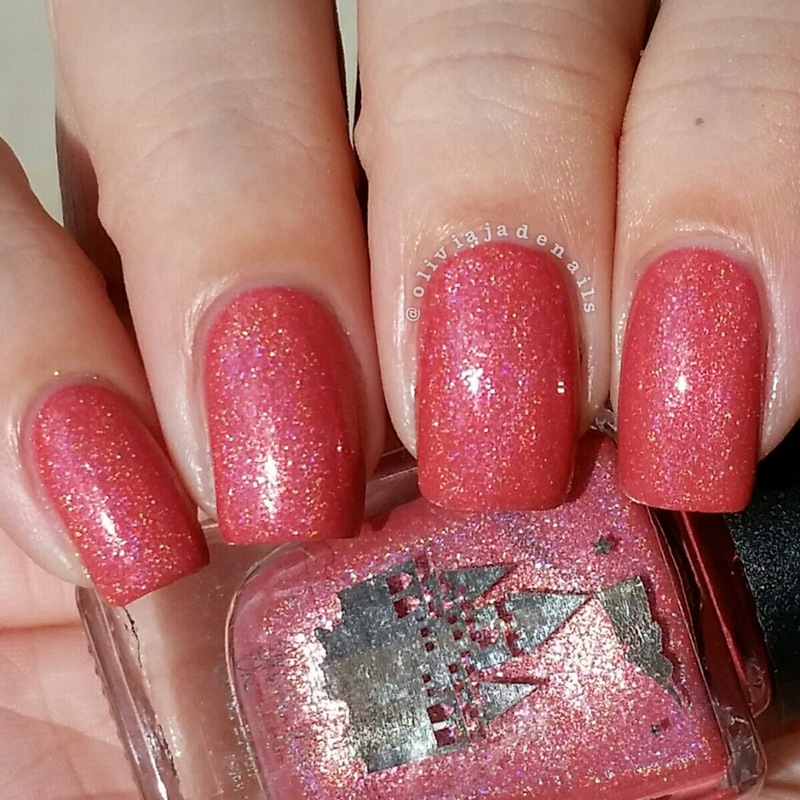 Princess Rose is a soft pink (somewhere between a baby pink and a candy pink) linear holo. 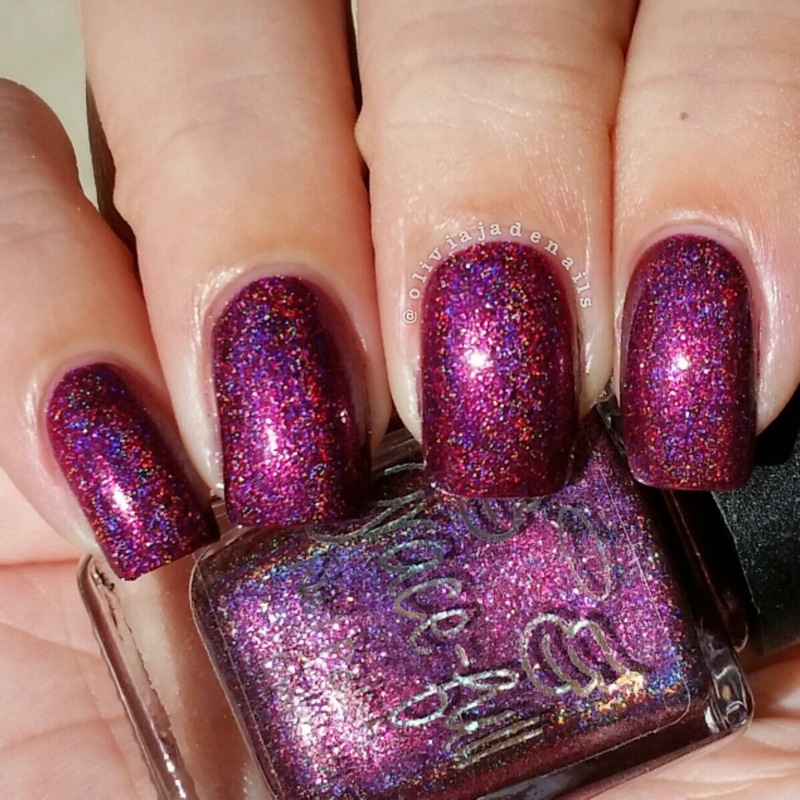 Violetta The Dragon is a mid violet linear holo. How beautiful is this collection? It definitely captures that fairy tale well. I love the colours, the formula and the limited edition labels are adorable. This collection is definitely a great way to kick off the first birthday celebrations. 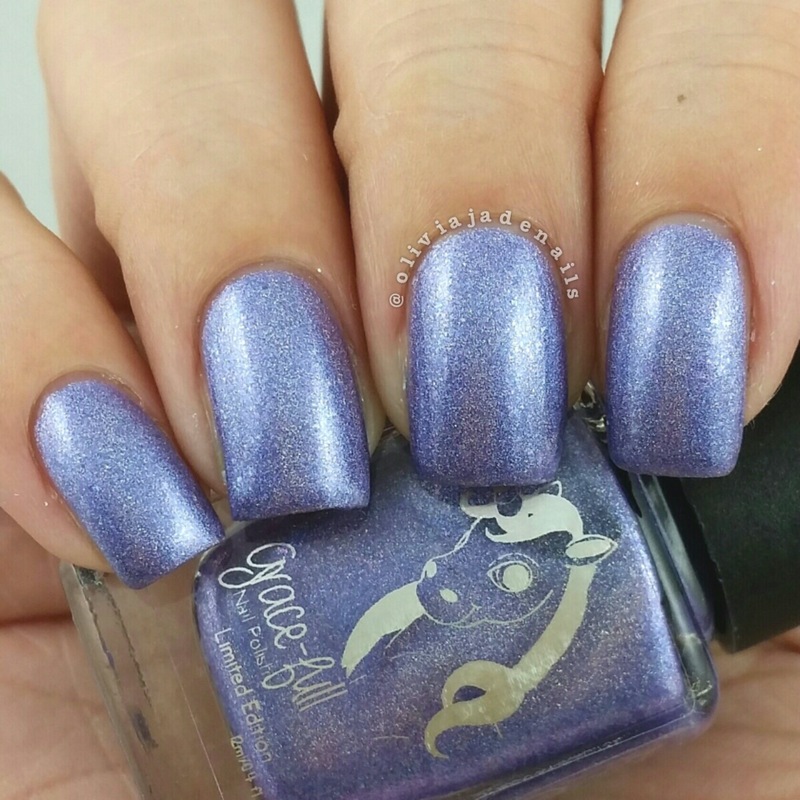 The Happily Ever After Collection is being released on September 1st at 7pm and can be purchased from the Grace-full Nail Polish site. As mentioned earlier in this post, there is a bunch of new and exciting things being released in September. 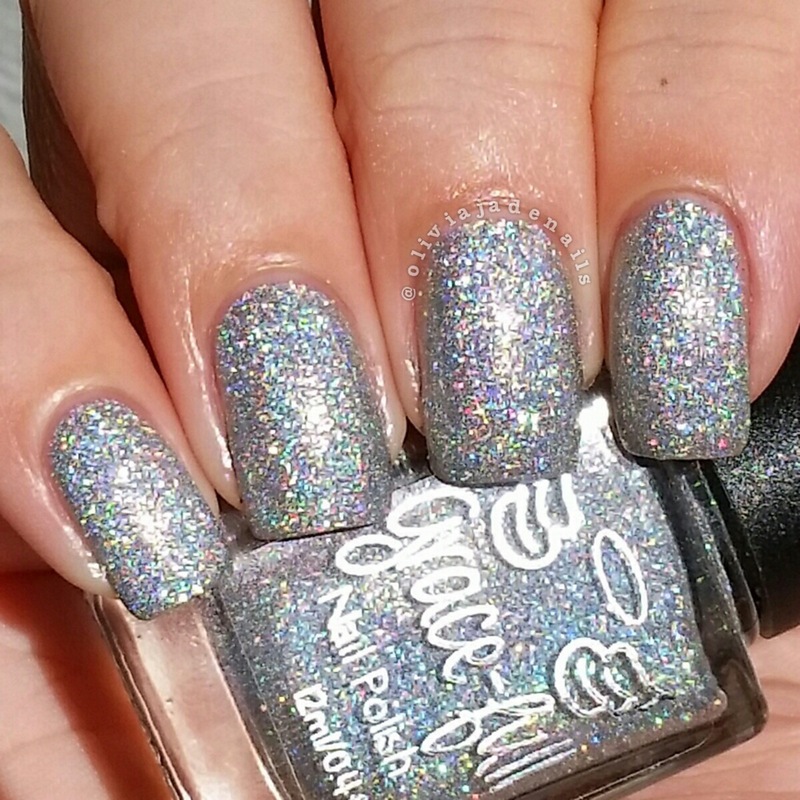 I will be posting swatches and a review of the other polish collection later this week but make sure you are following Grace-full's Facebook Group because there is lots of info and pictures shared in there. Plus there is the added bonus of getting to know some fellow Grace-full fans and share your pictures too. 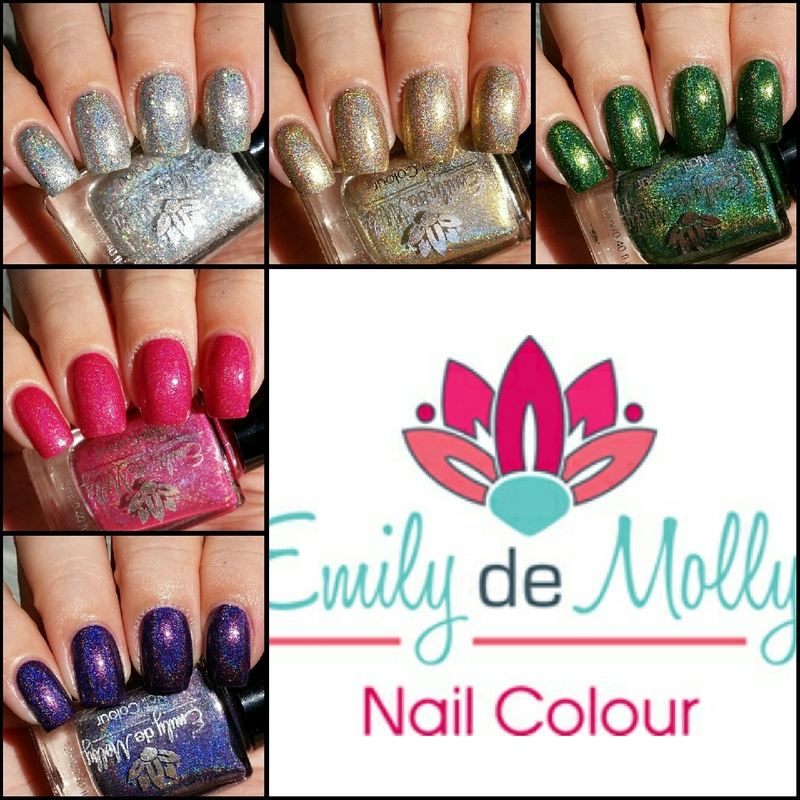 I am back with some more Emily de Molly swatches (you can see my other swatches here and here). I was re-arranging my polish drawers again the other day and it occurred to be (again!) how many untrieds I have - in particular the Emily de Molly's. I would say that Emily de Molly is definitely one of my favorite indie brands, the range is fantastic, the formulas are great and I buy from there regularly, so why do I have so many untrieds? I have no clue what so ever. Well actually it's probably more a "so many untrieds, so little time" situation. I'll have to put my thinking cap on about how I can get through some more of my untrieds. Anyway, future Tracy can deal with that. Let's get into the swatches I have done. 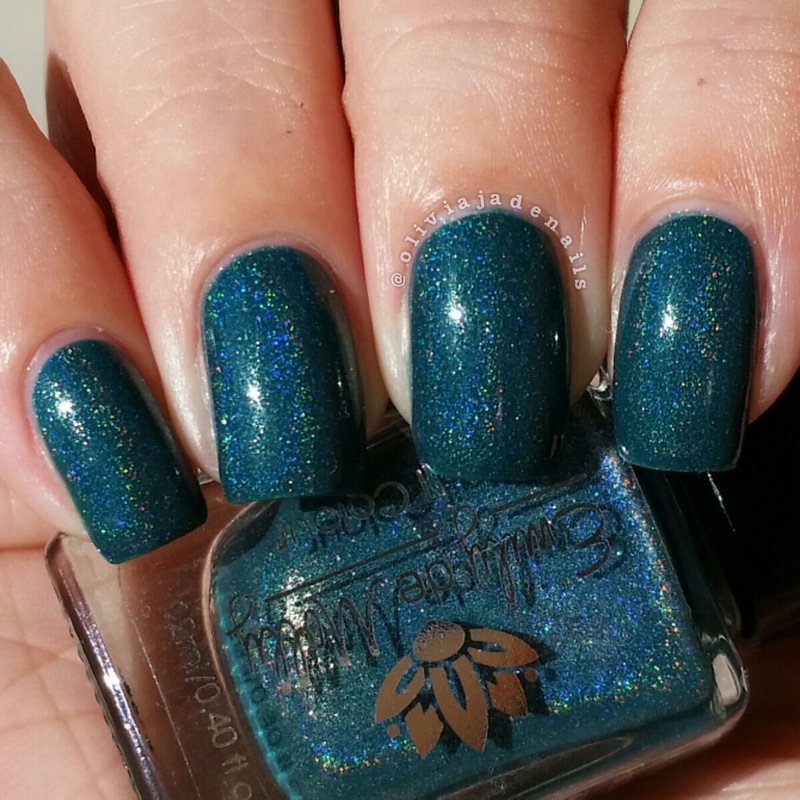 Forever And Ever is a dark teal creme with subtle holo. 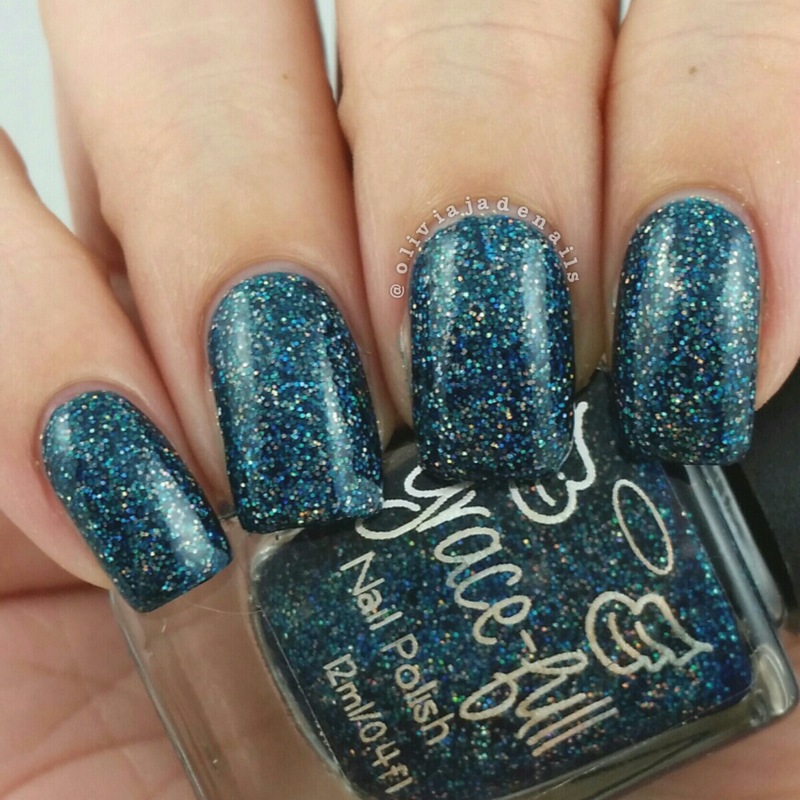 This is actually the Charity Of The Month polish for August (which is still up on the website as I write this and is available via some of the international stockists - so grab it while you can!). 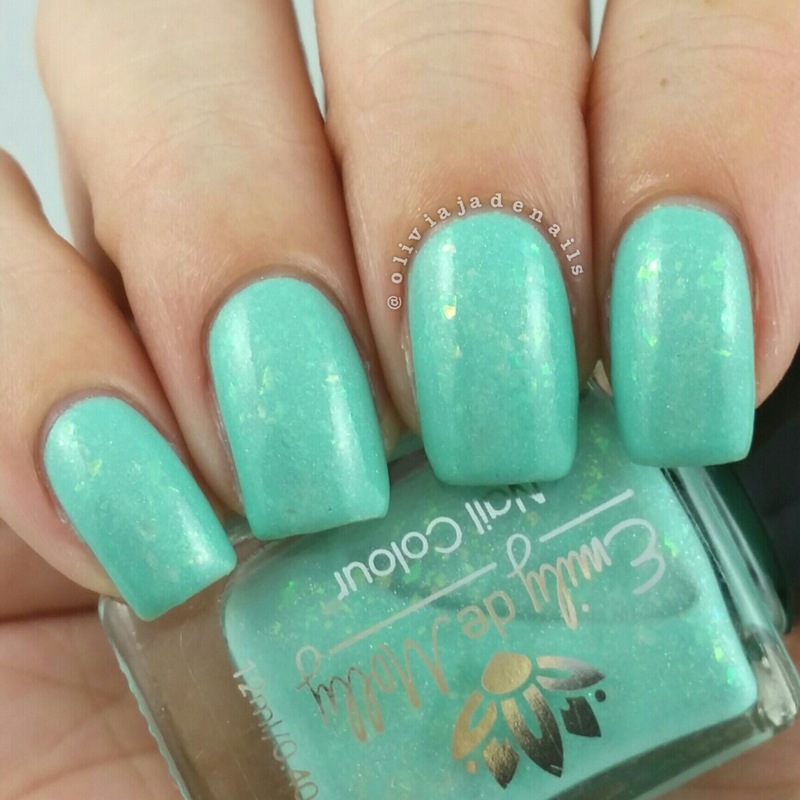 The polish is a gorgeous colour and the formula is so easy to work with. I used two coats for my swatch. 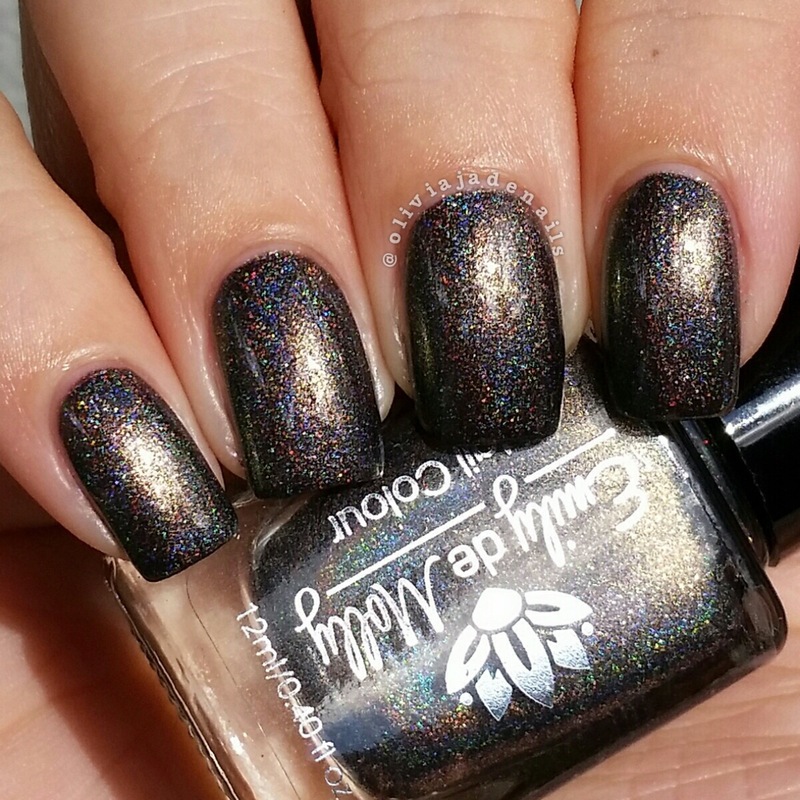 It's Complicated is a greyish white crelly with black, purple and silver holo glitters of various shapes and sizes. This polish is quite sheer in colour so slightly thicker coats was required. I found that there wasn't a heap of glitter in this polish so they are quite sparse on the nails (especially looking at other people's swatches). Great polish still. 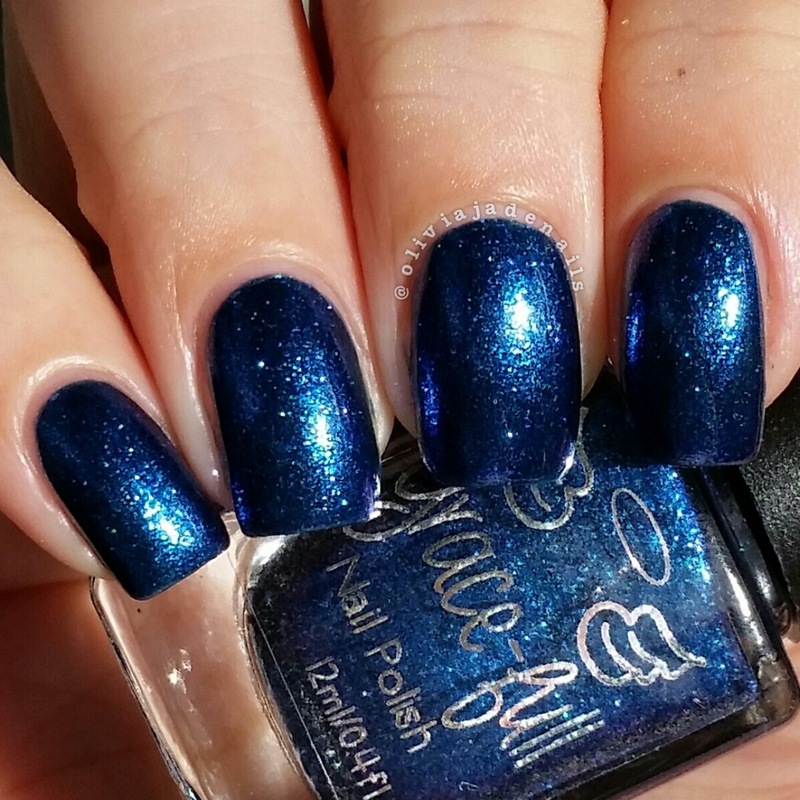 Unfortunately, this polish has been discontinued (I believe it was originally released in 2012 - but that is a guess) so it may be a little hard to find these days. 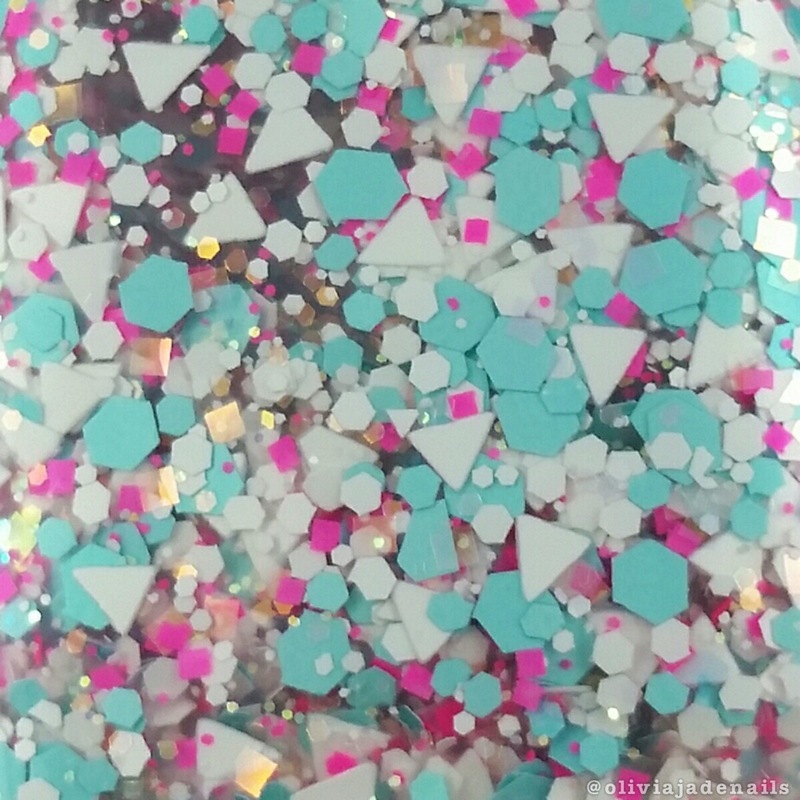 Love Triangle is a clear glitter topper with white triangles and hexes with blue, neon pink and orange to green iridescent glitter. 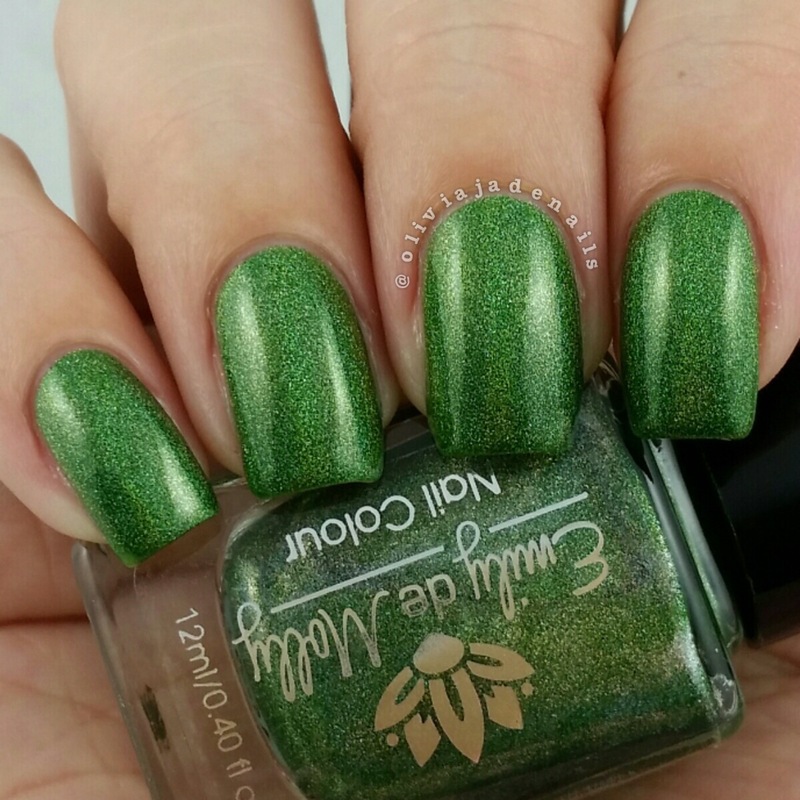 I fell in love with Haley's swatches of this and had to have it and it did not disappoint. I definitely need to try it over some other base colours. I used one coat over OPI Mod About You. 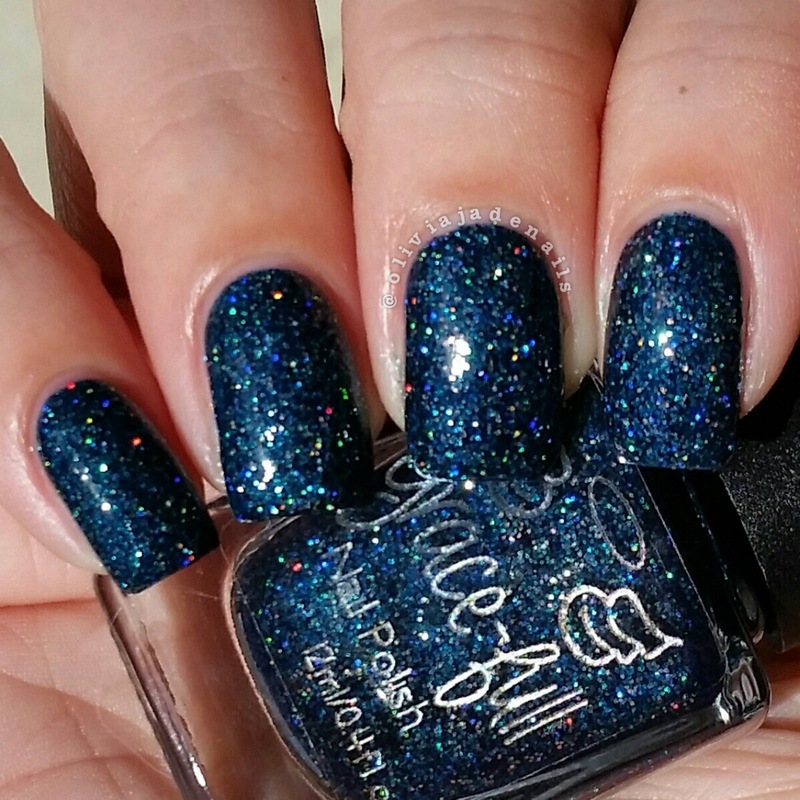 This polish is still available and is on sale over on the Emily de Molly website. So Many Activities! 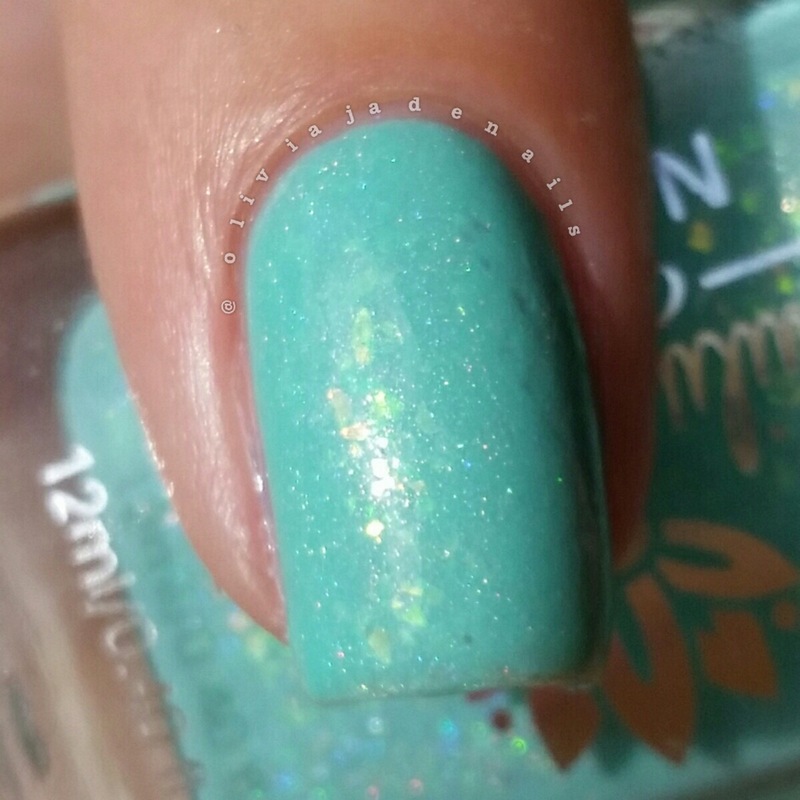 is a mint creme with subtle holo and colour shifting flakies. 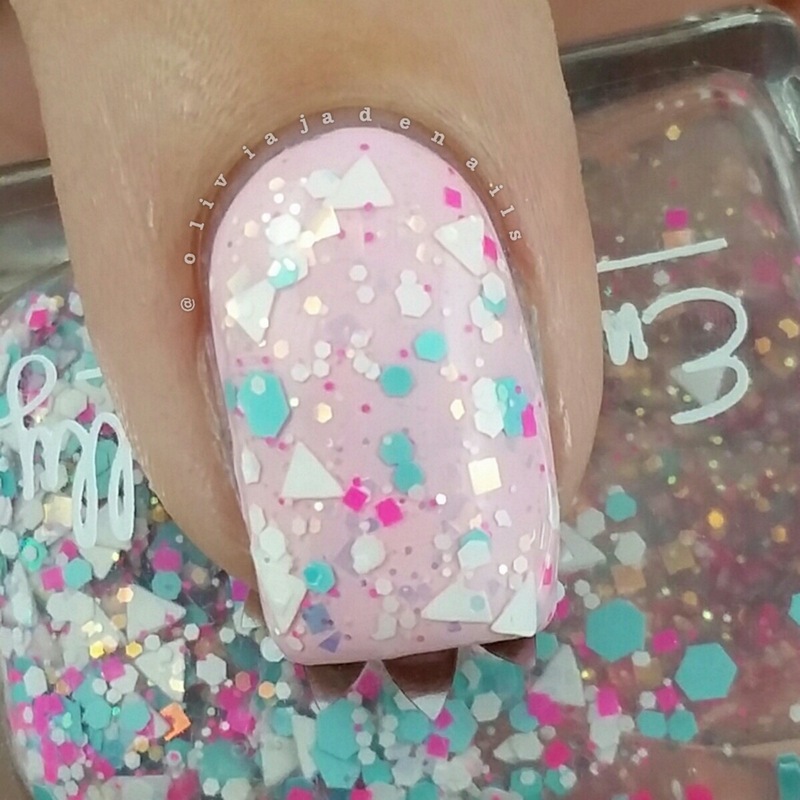 The flakies are a little tricky to see (and capture in pictures) but are more visible in person. I found that the first coat of this one was slightly tricky to apply as the flakies liked to drag the base colour off. I found that loading the brush up and floating the polish over the nail helped with this. The second coat applied easily. 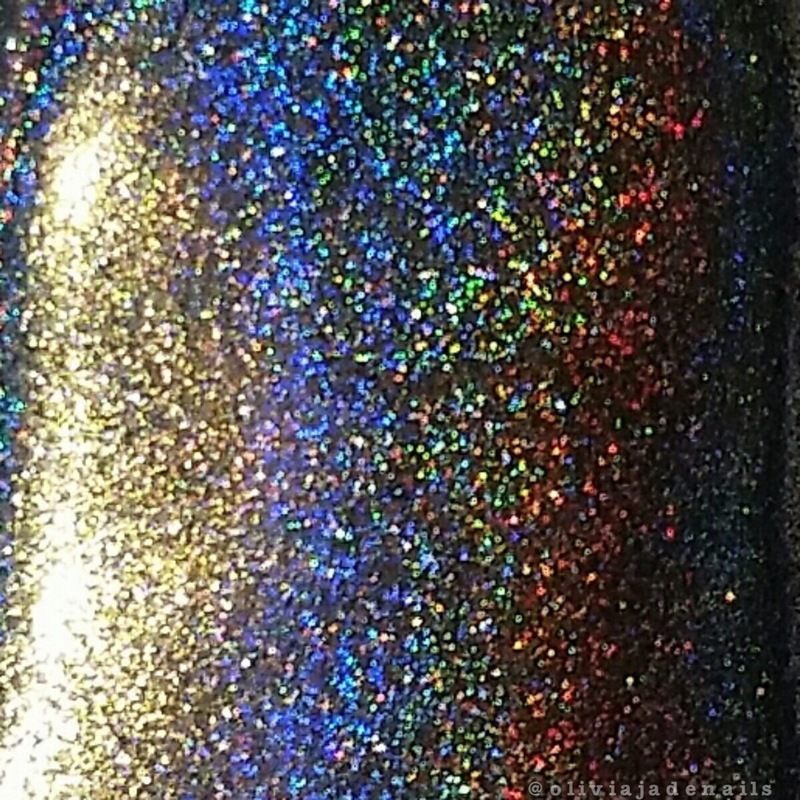 This polish is currently still available. 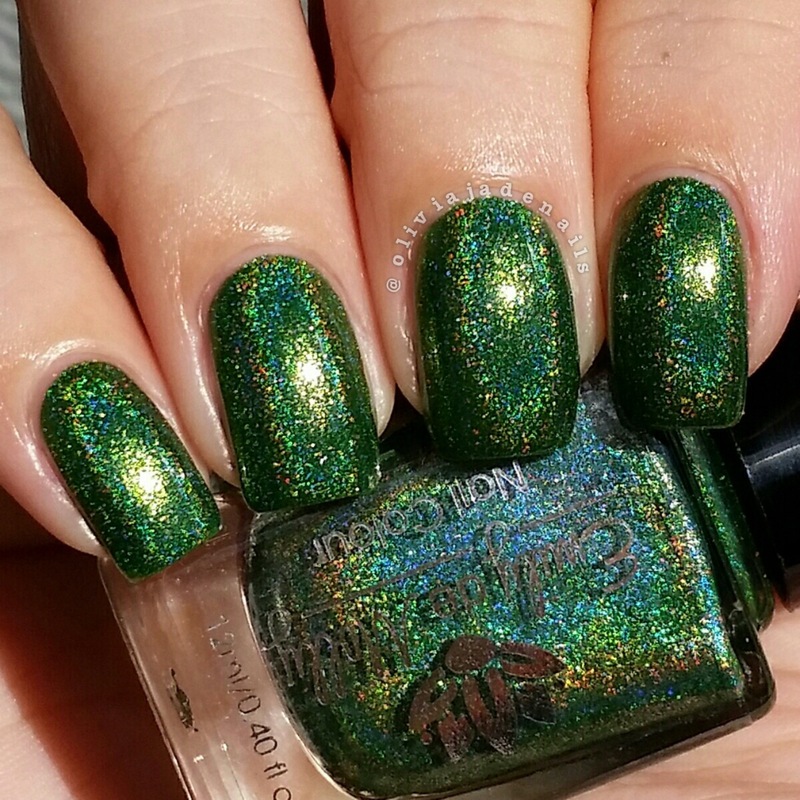 Terra Firma is described as a brown to green duochrome with small gold flakies. So pretty and definitely unique in my collection. 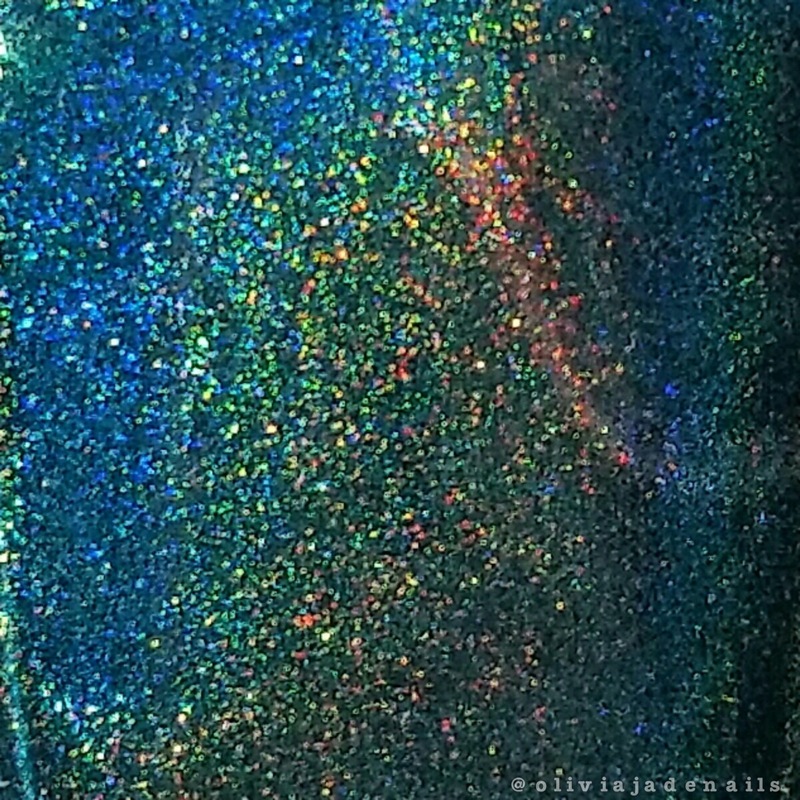 Plus it's holo! How can you not love that? The formula is fantastic as well. I used two coats for my swatch. This polish is still available. I love all of my Emily de Molly's. I actually have some of the latest release polishes sitting in my "to swatch" rack so keep your eyes peeled for those posts. I can't wait to try them. I am just waiting for some spare time and sunshine to swatch them. Australian customers can purchase from Emily de Molly's Australian site, US customers now can purchase from Emily de Molly's US site, and for all other customers head over to the stockists list.